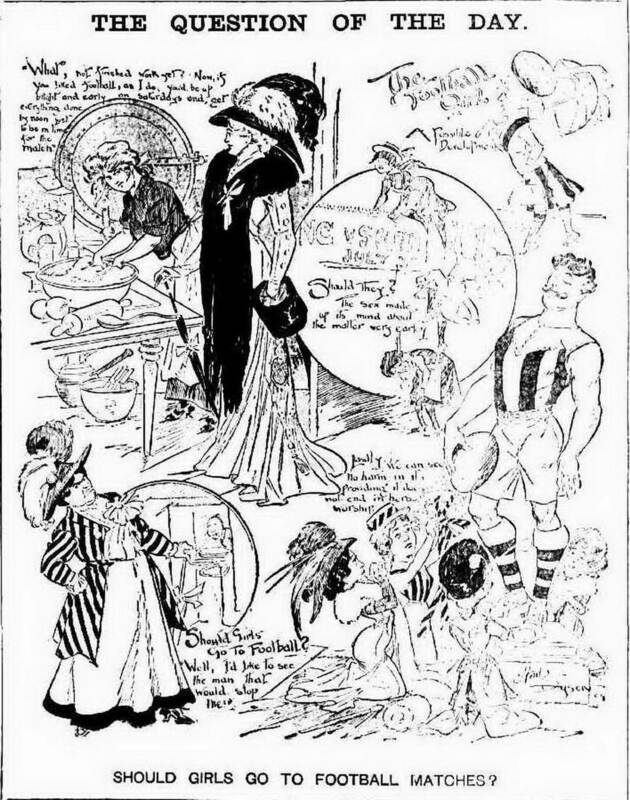 Ambrose Dyson (1876 – 3 June 1913), often known as Amb Dyson was an Australian illustrator and political cartoonist, born at Alfredton, near Ballarat, Victoria, Australia, the son of George Dyson, then a hawker and later a mining engineer, and his wife Jane, née Mayall. 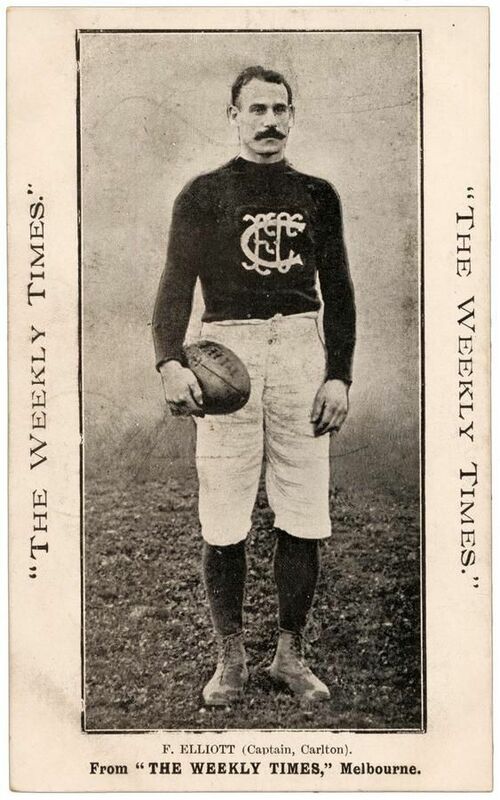 He was educated at state schools at Ballarat and South Melbourne. 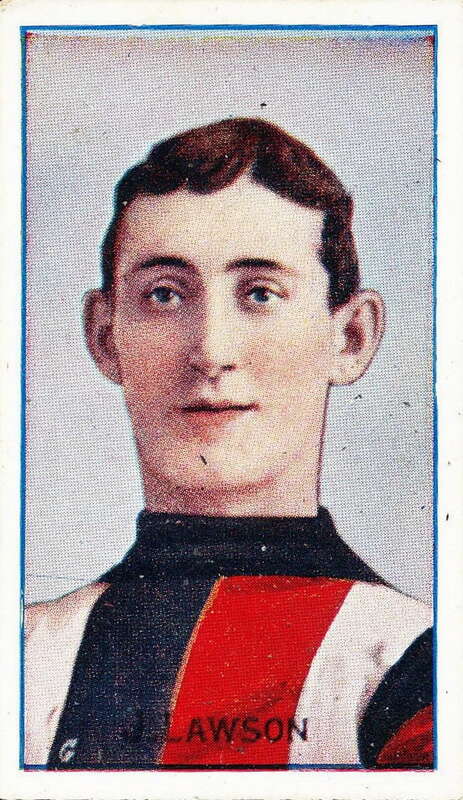 He was the older brother of the brilliant Will Dyson and the writer Edward Dyson. 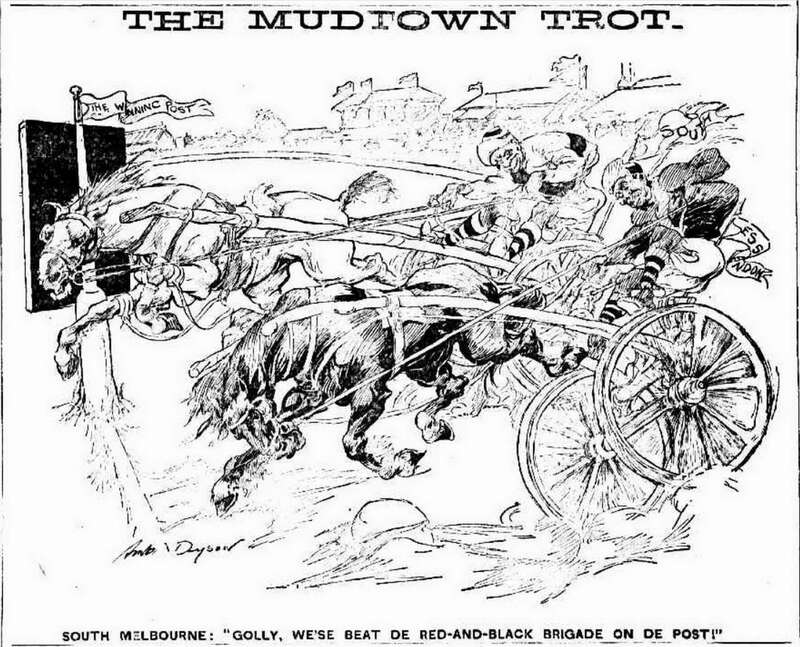 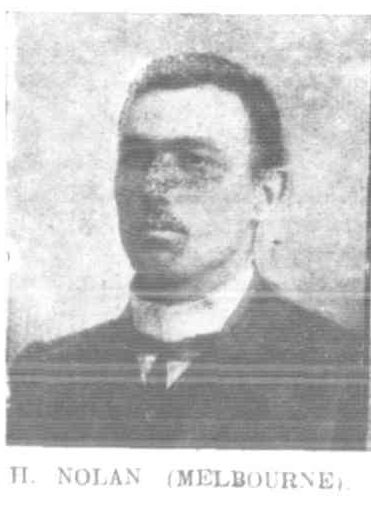 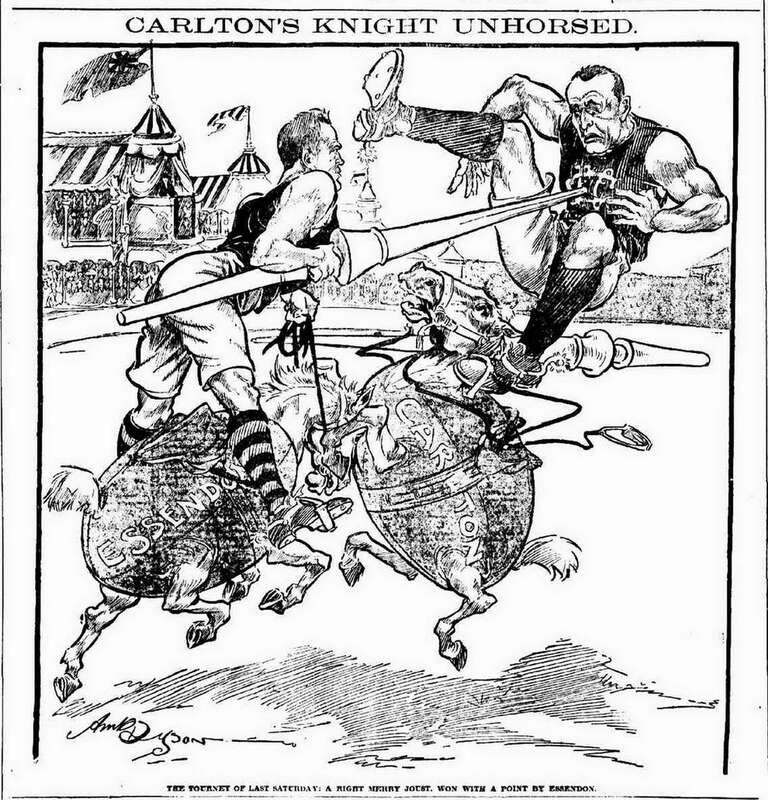 He was a frequent contributor to The Bulletin and Melbourne Punch, but his first regular position was with the Adelaide Critic from 1899 to 1903, then with The Bulletin He worked as cartoonist for the Melbourne Table Talk from 1907 to 1910, while contributing to C. J. Dennis's Gadfly followed by the Sydney-based Comic Australian. 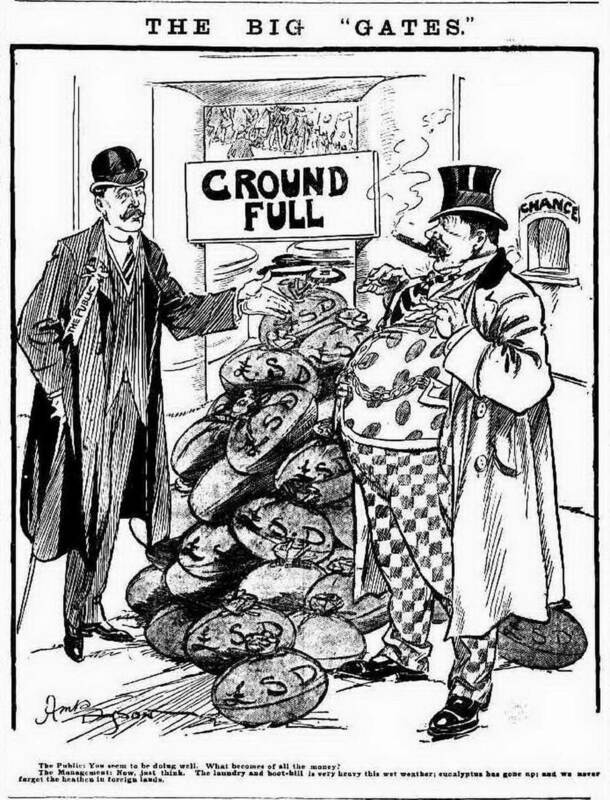 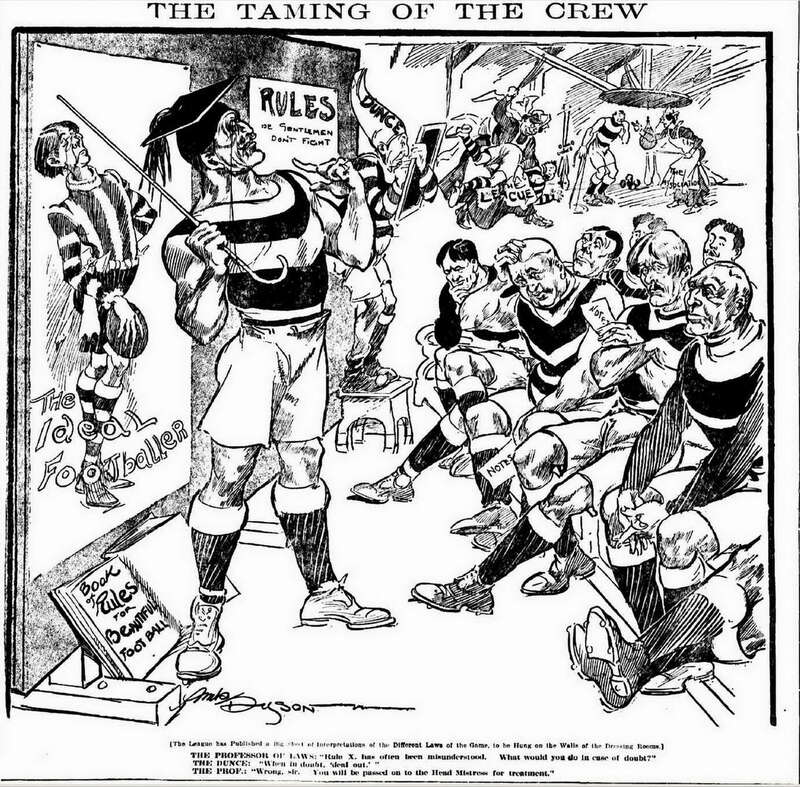 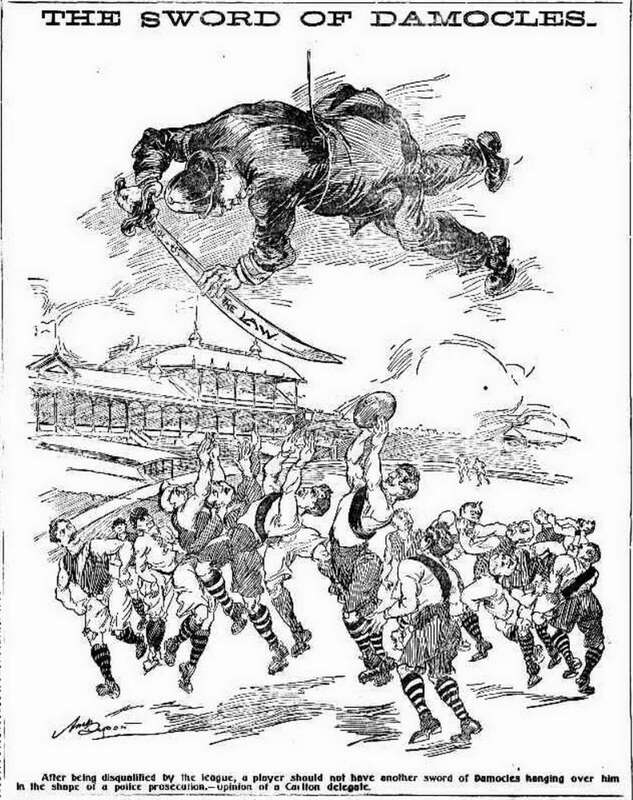 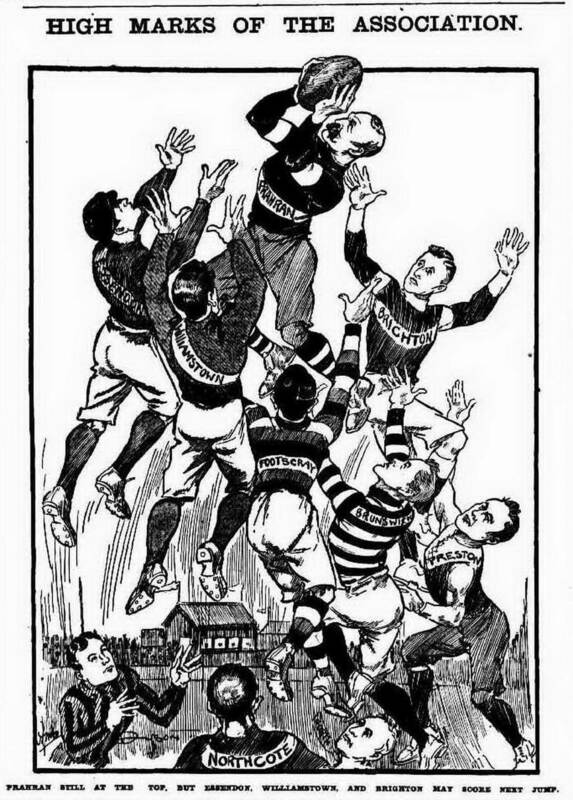 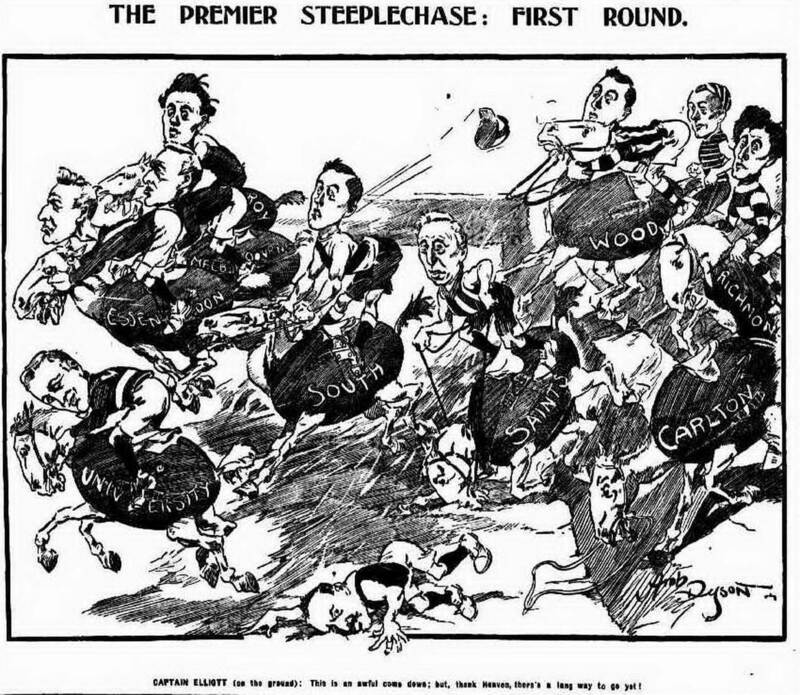 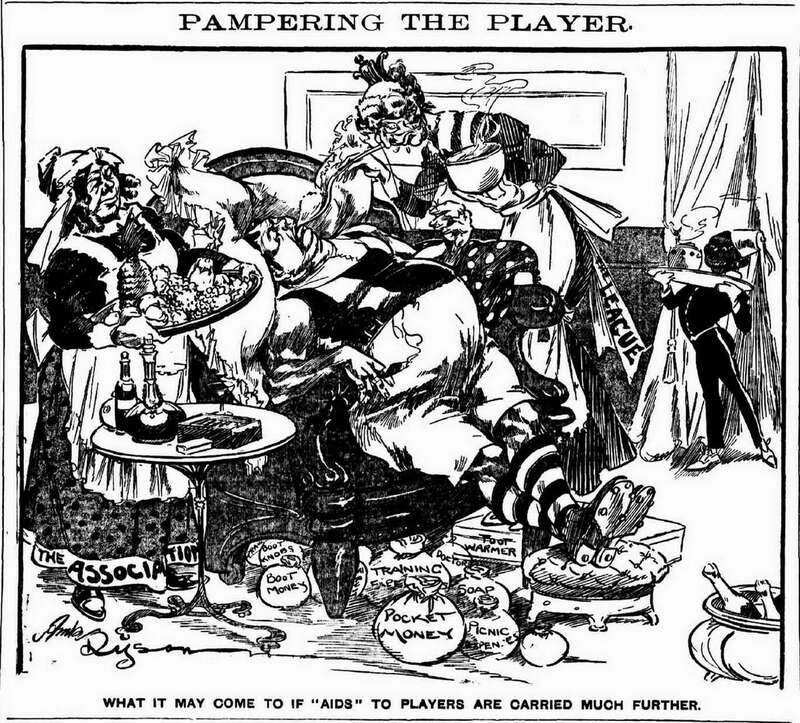 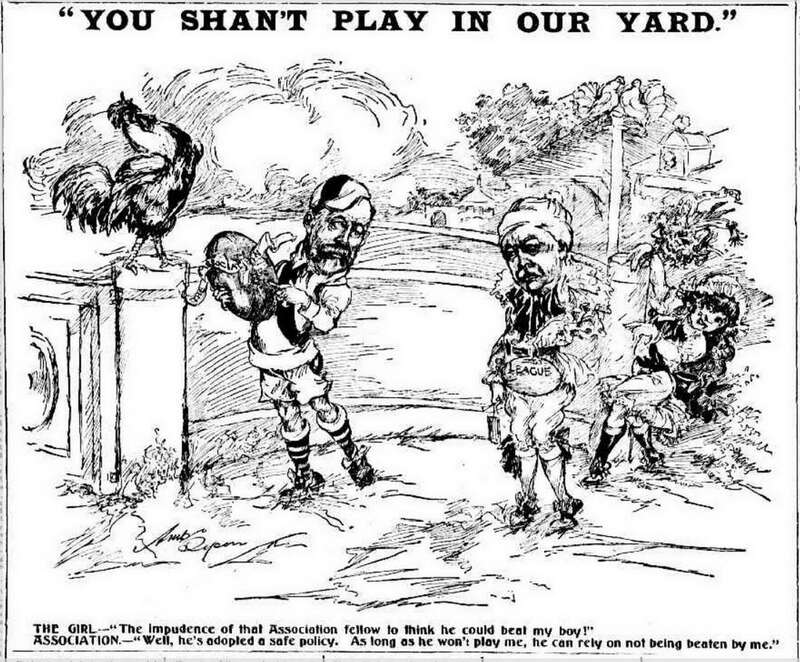 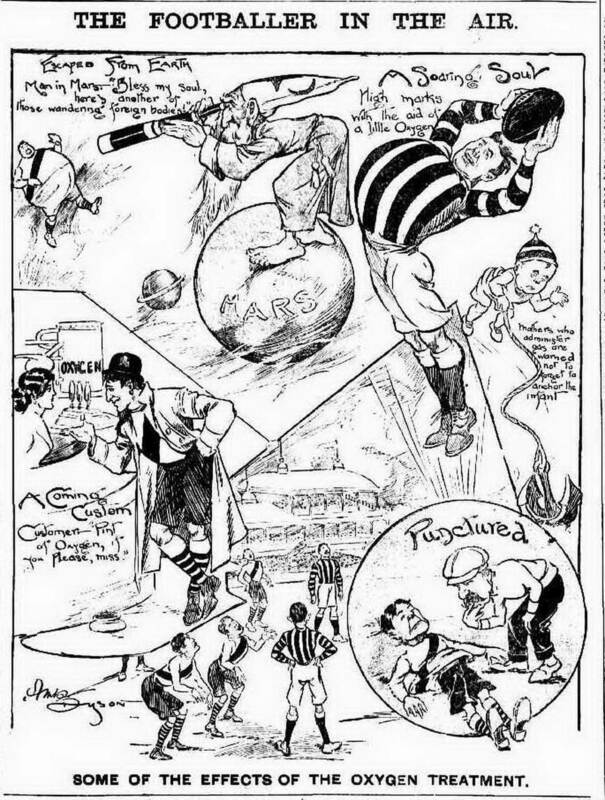 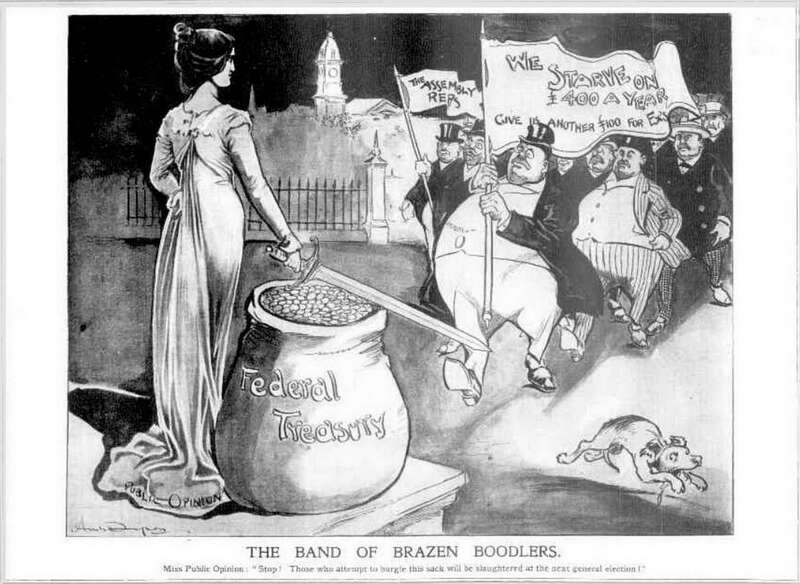 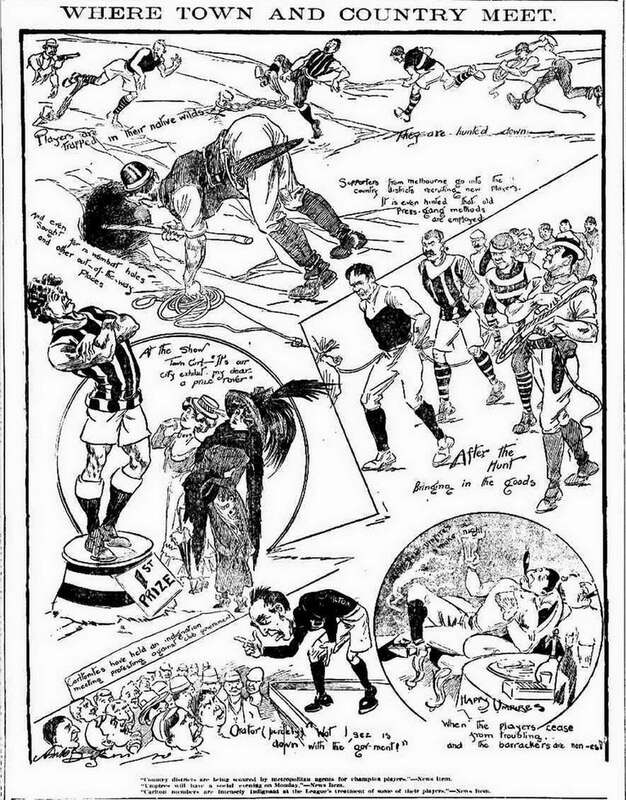 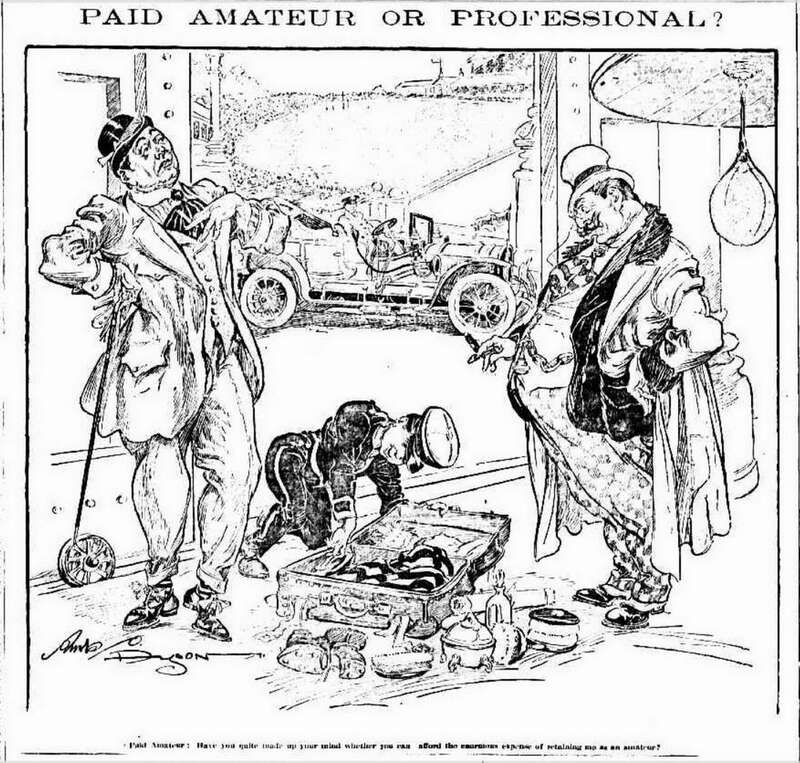 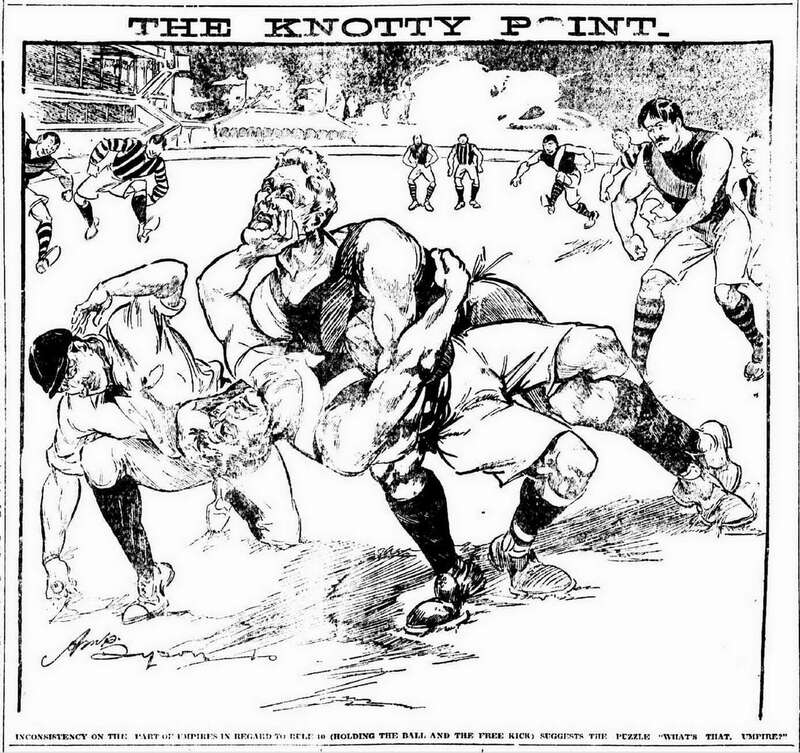 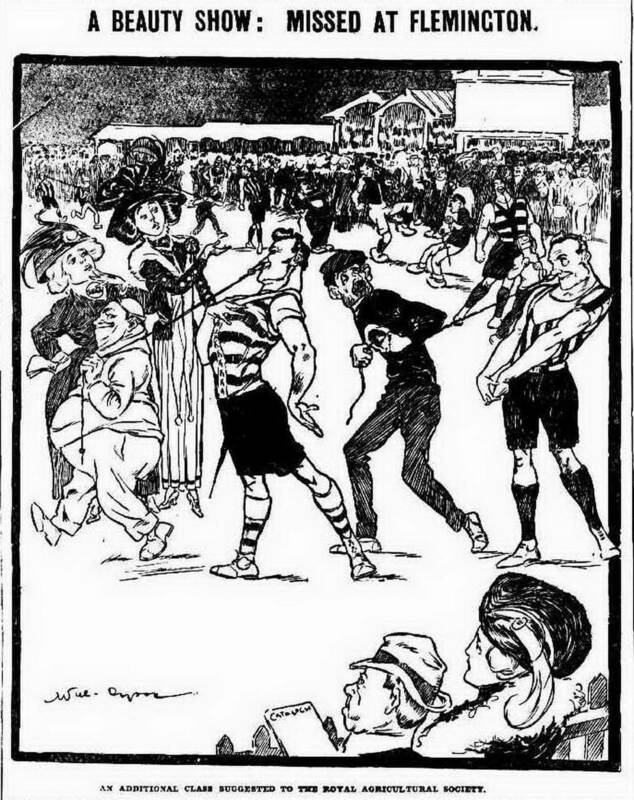 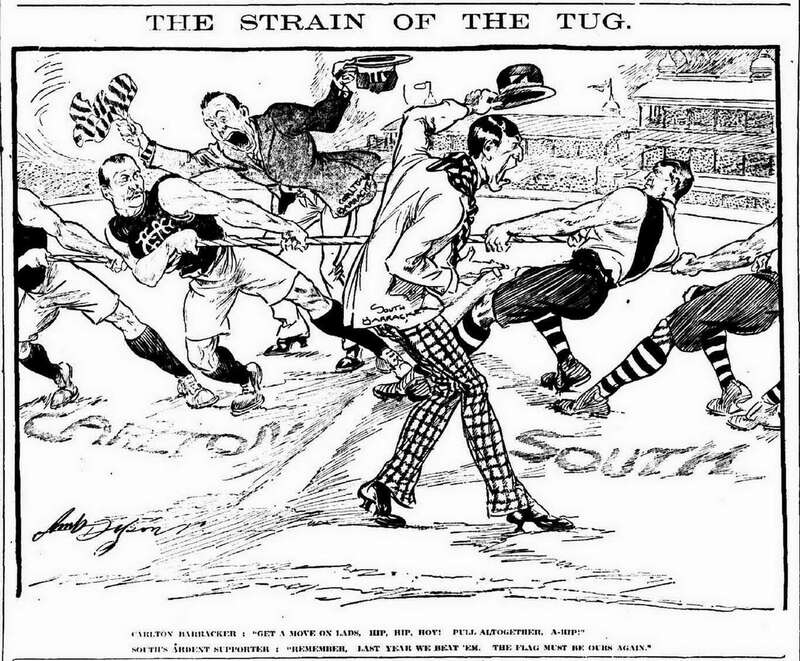 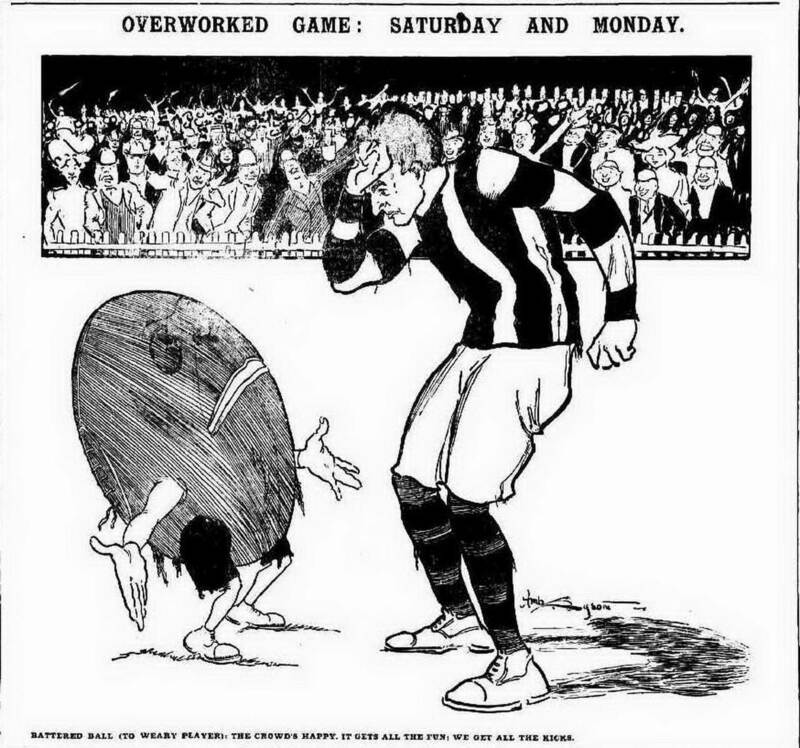 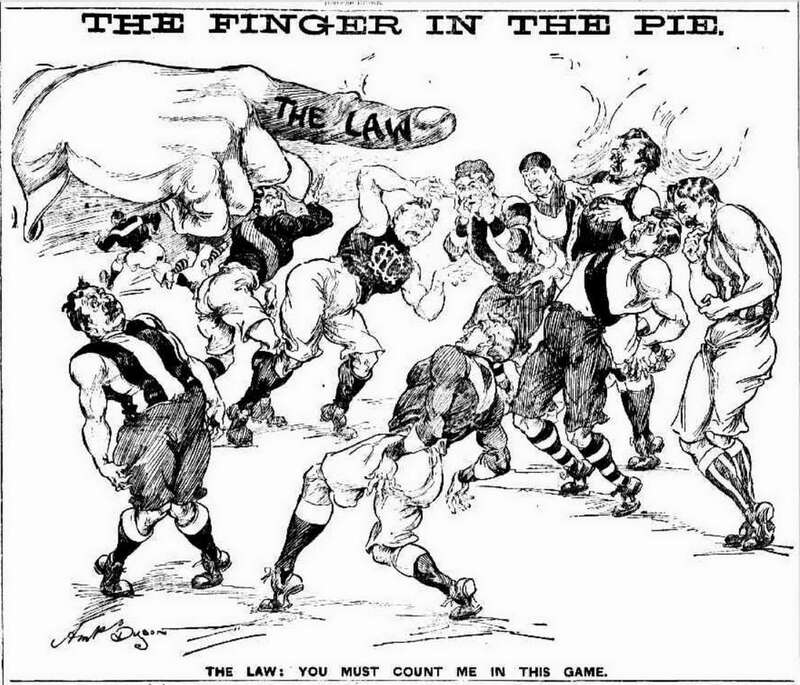 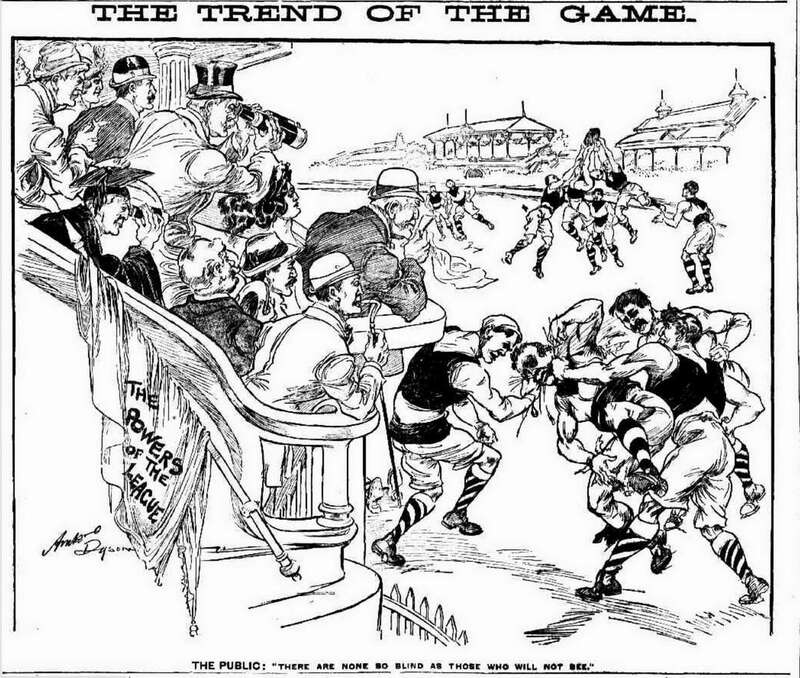 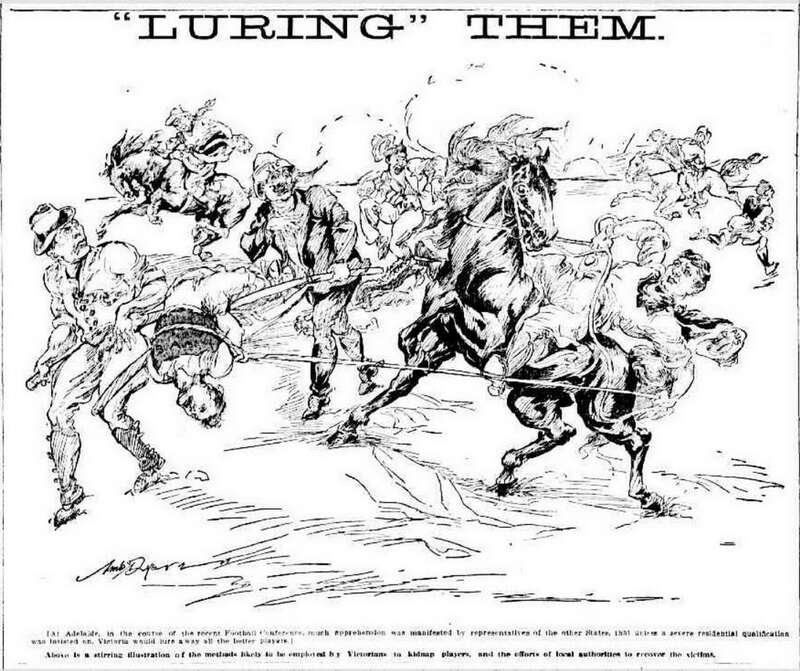 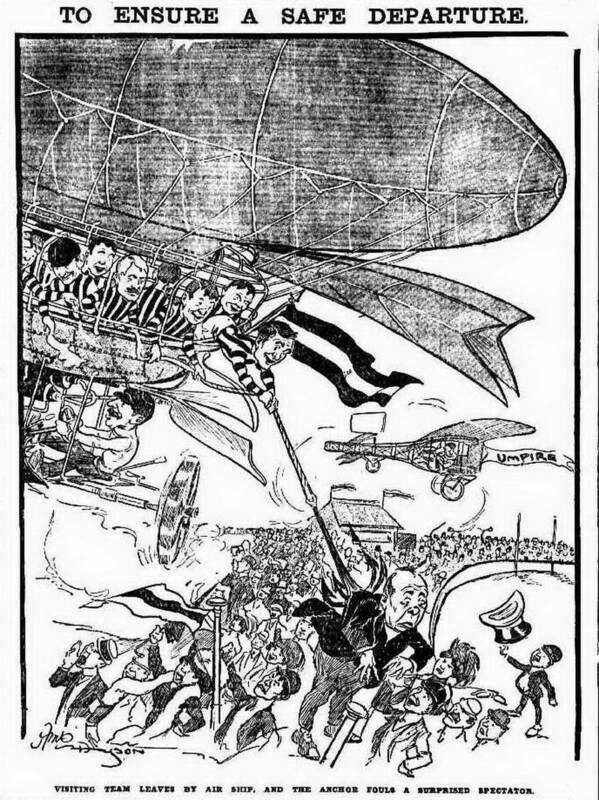 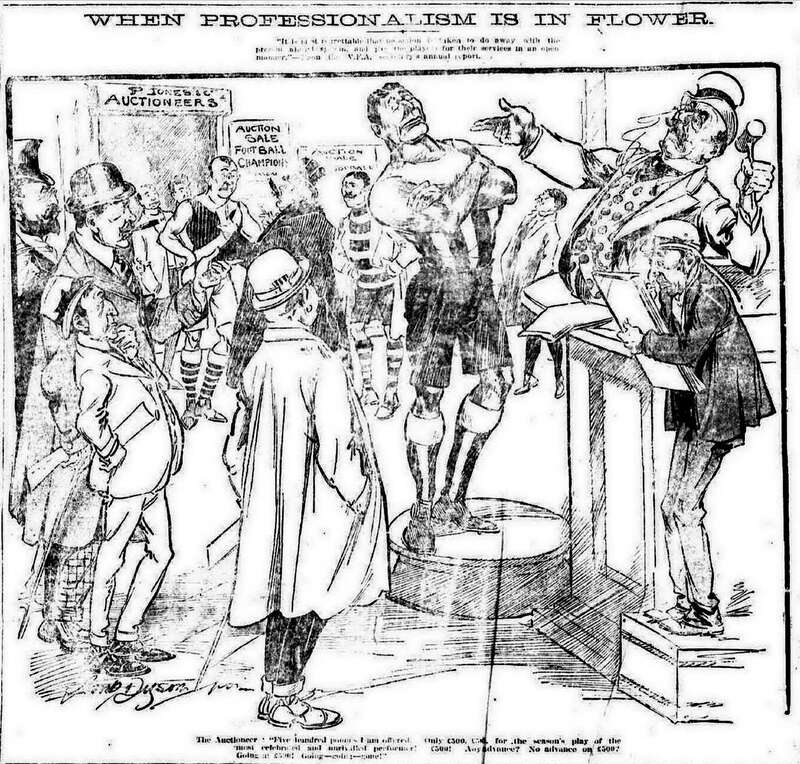 Dyson worked at the Herald from 1909 to 1911 and supplied a regular cartoon for the football section of the Friday paper. 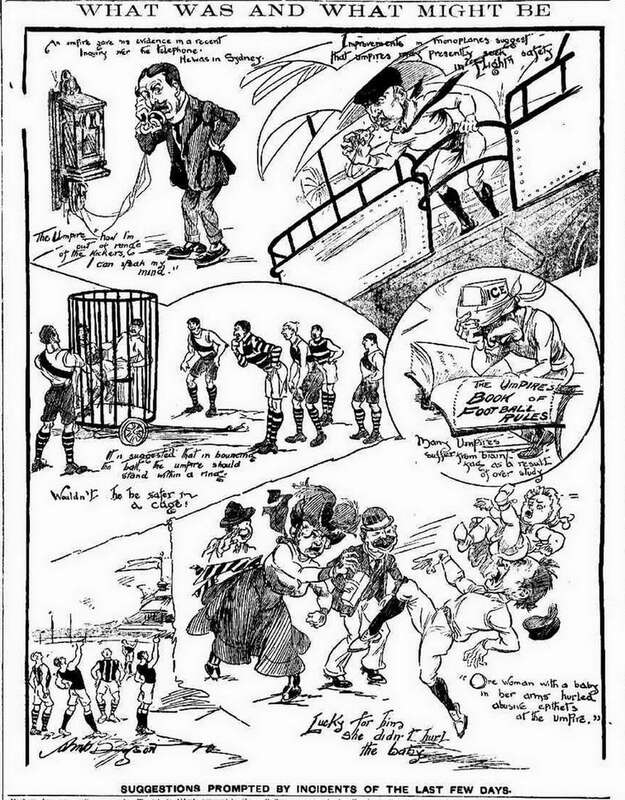 Dysons cartoons were large and took up a prominent place in the centre of the page. 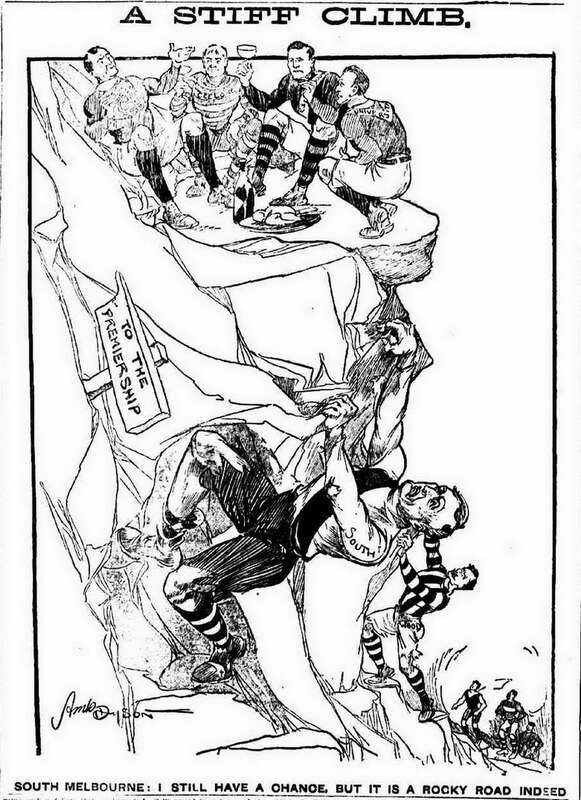 Their size allowed a level of detail that does not translate well to the computer screen . 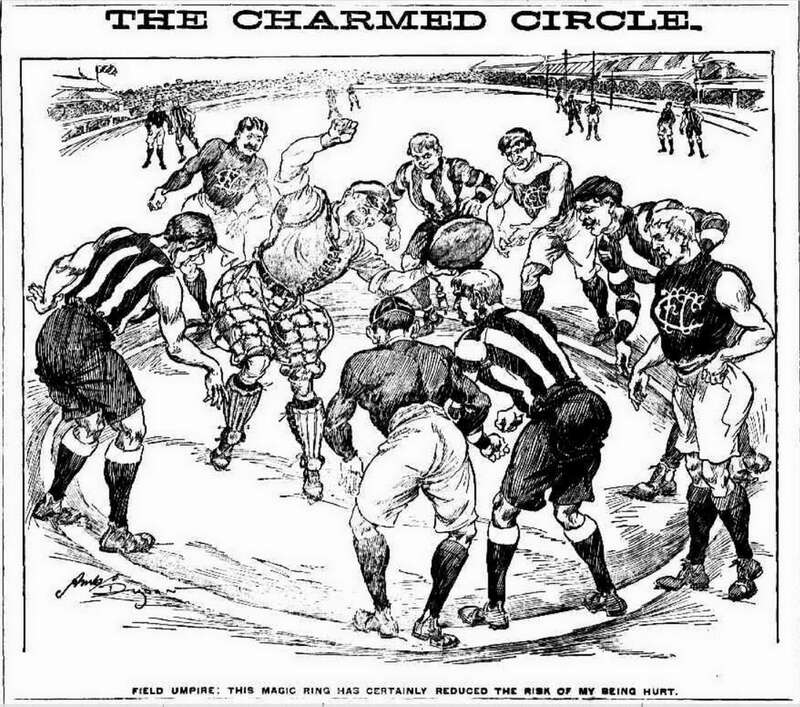 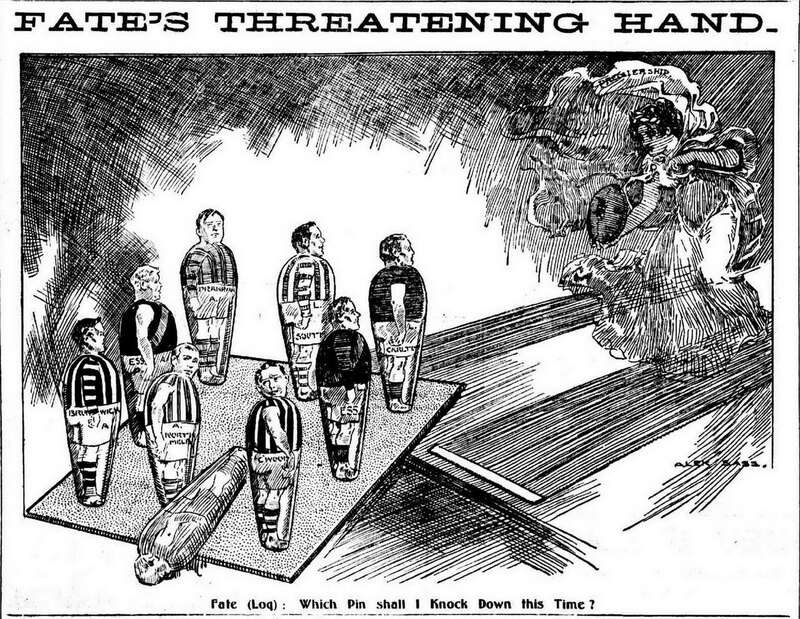 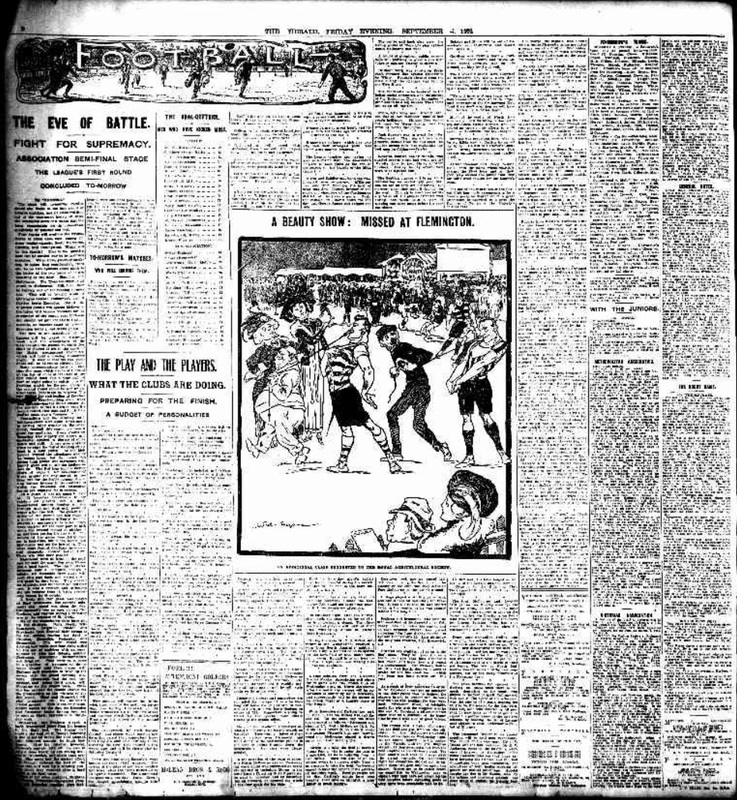 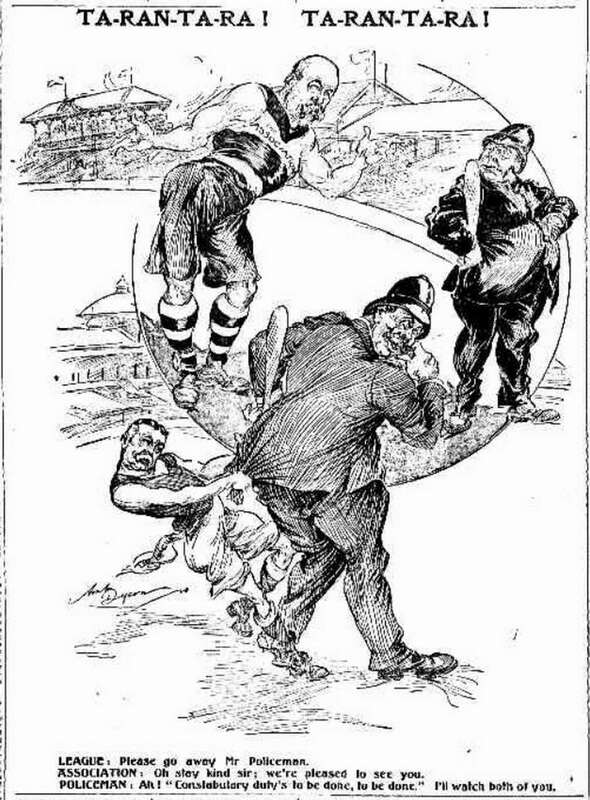 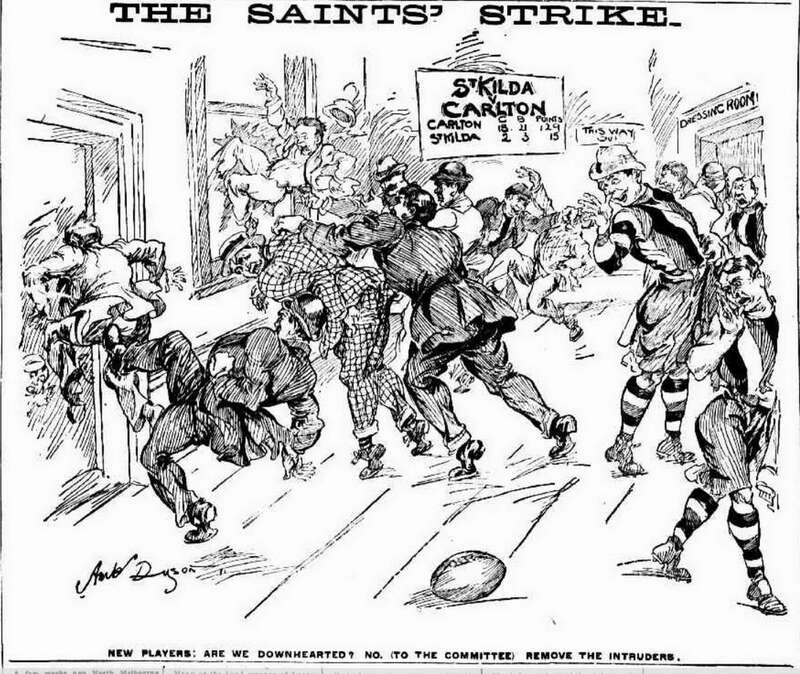 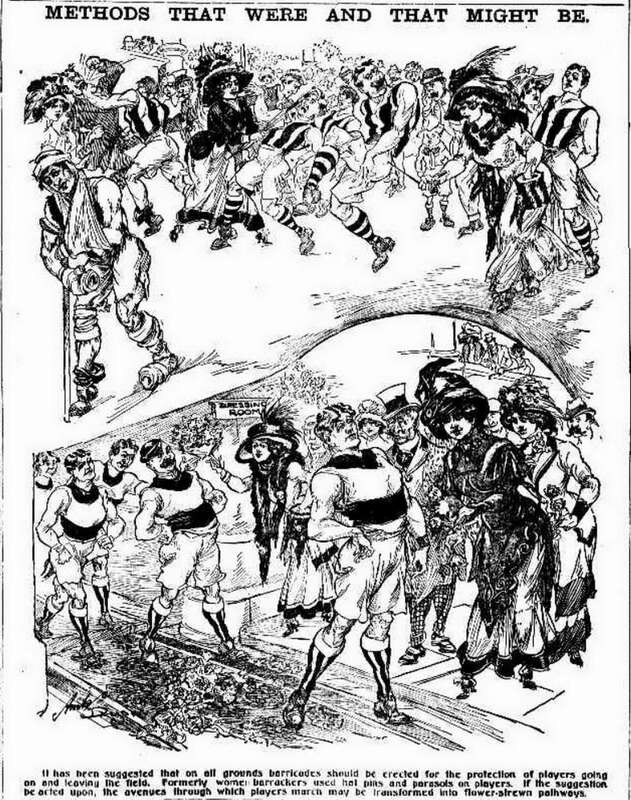 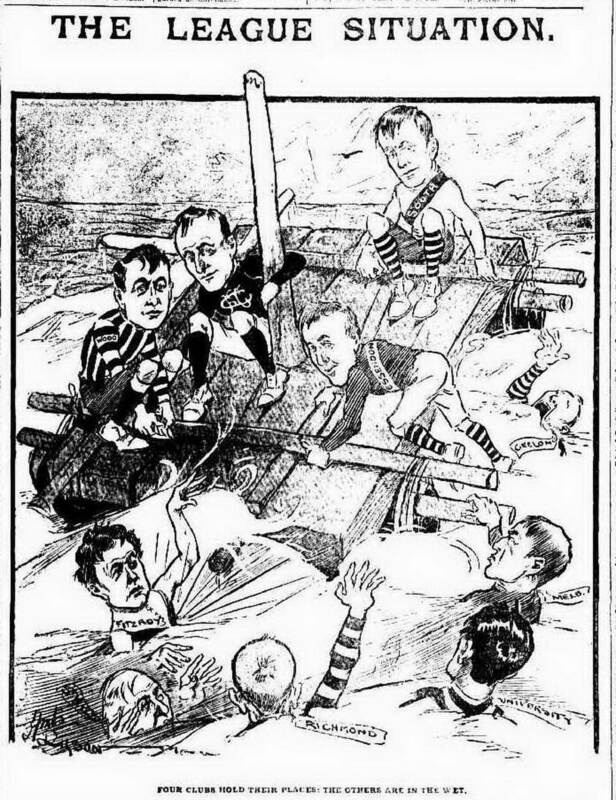 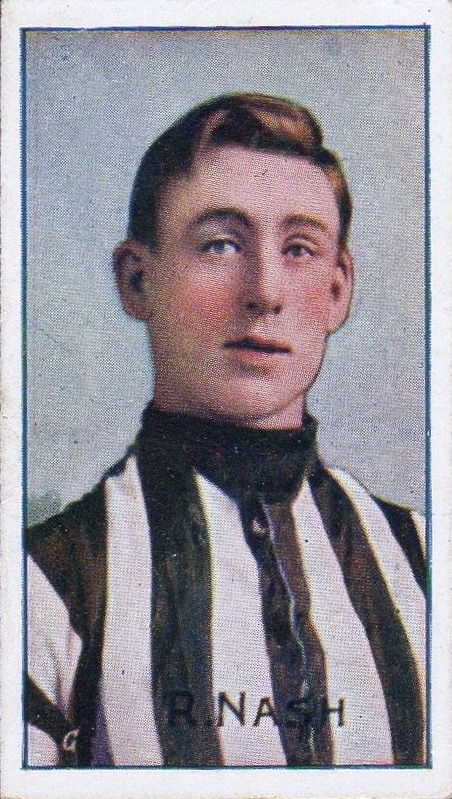 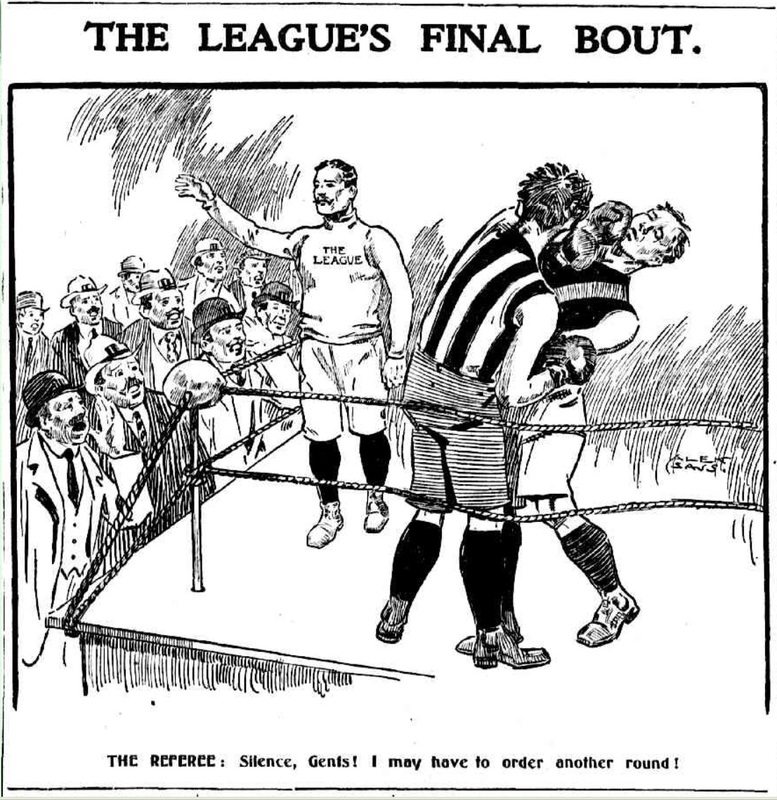 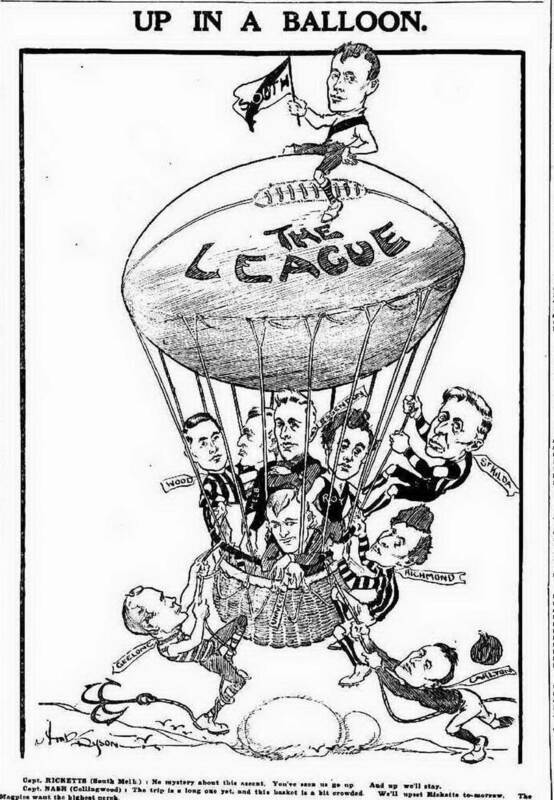 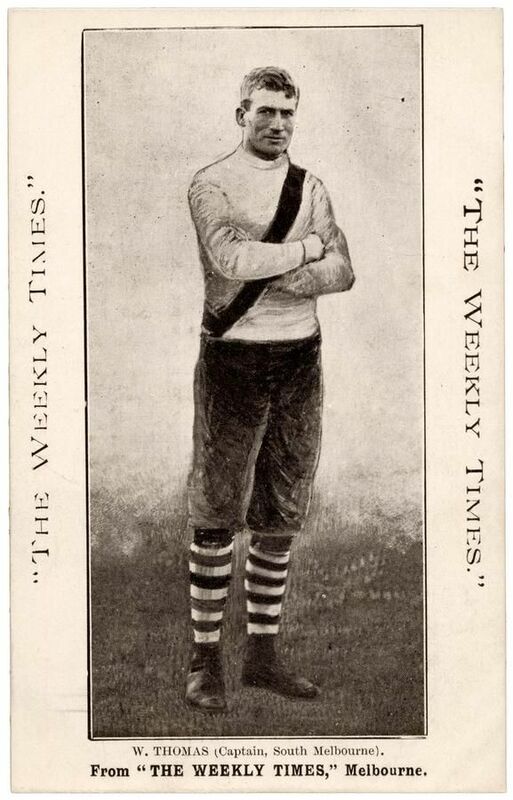 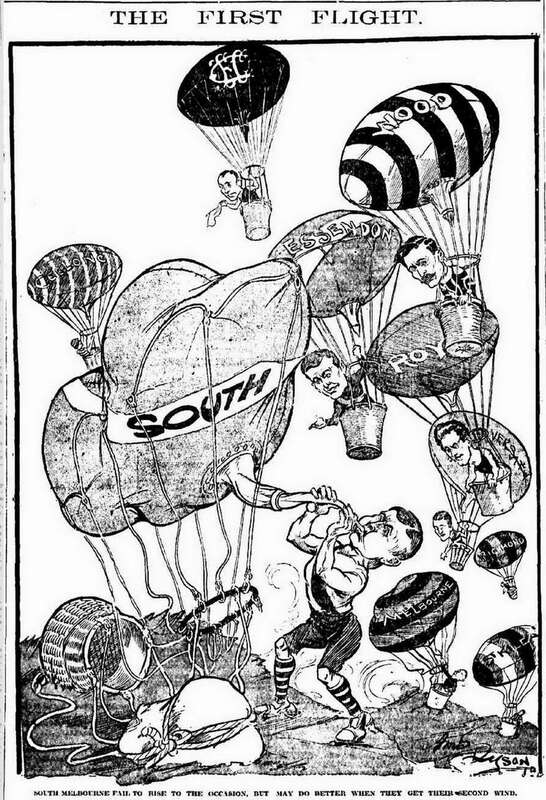 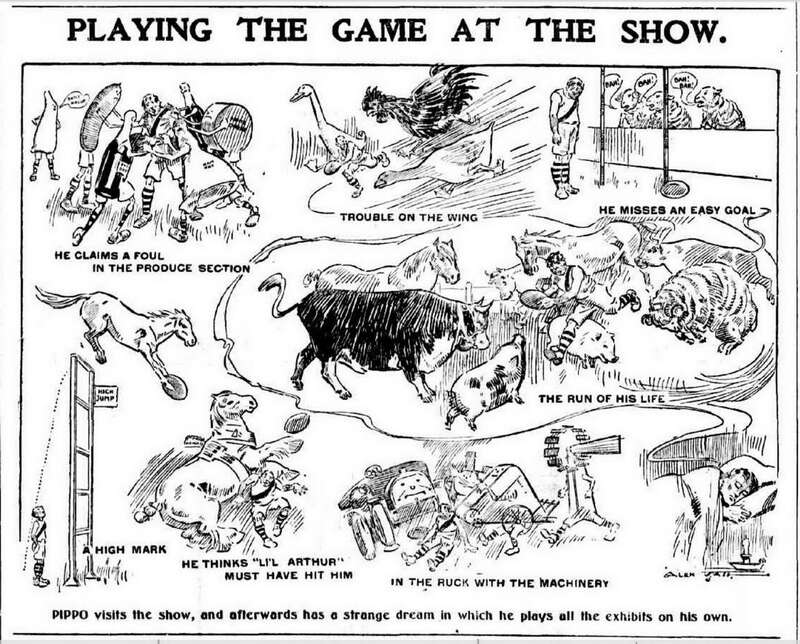 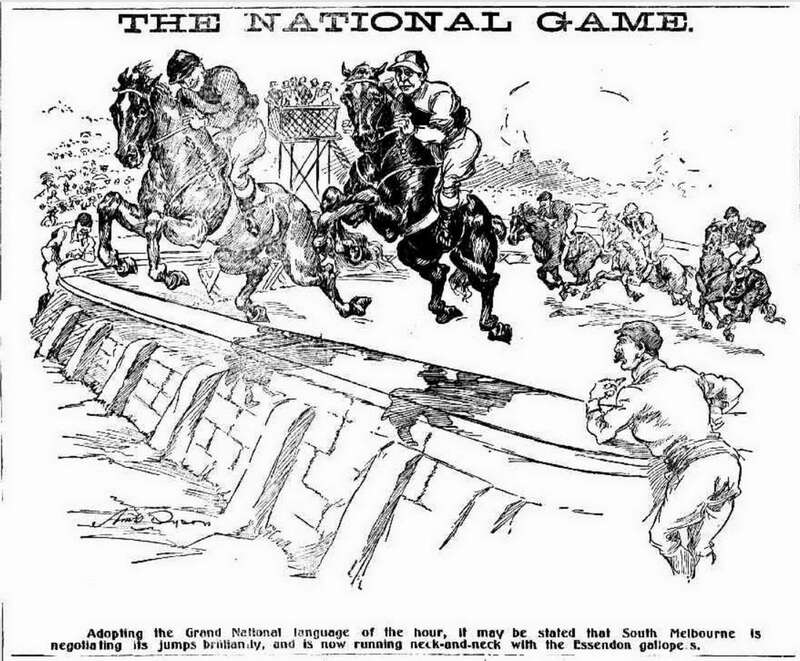 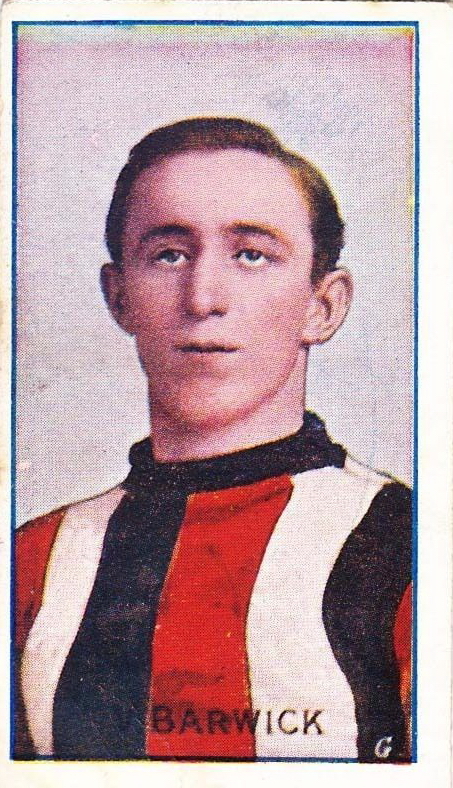 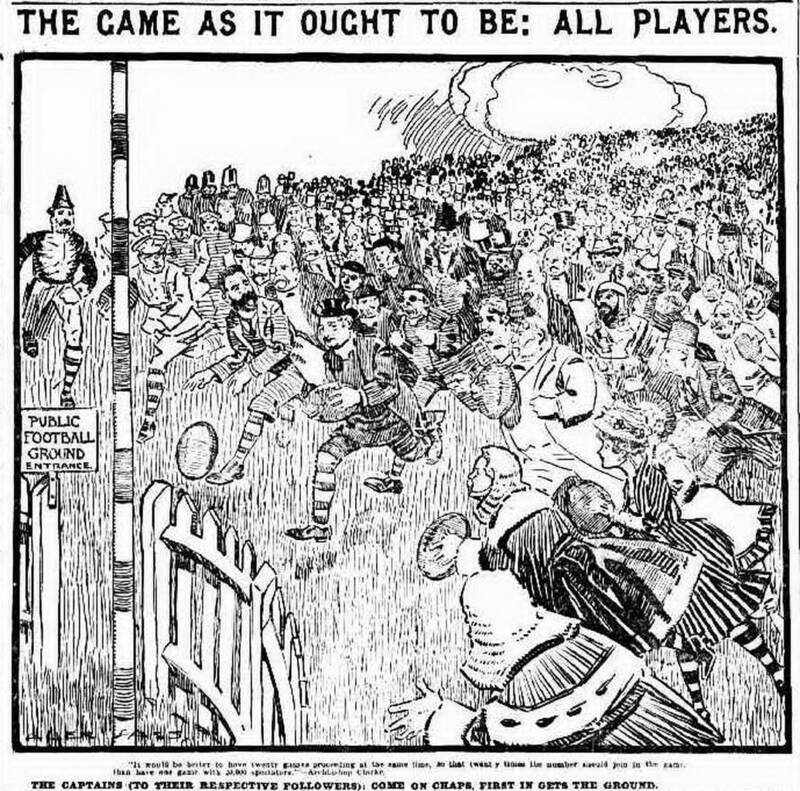 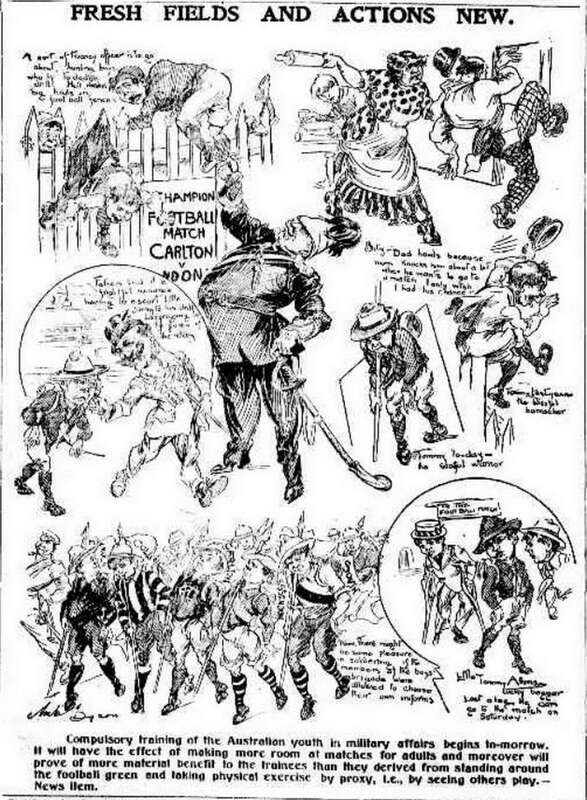 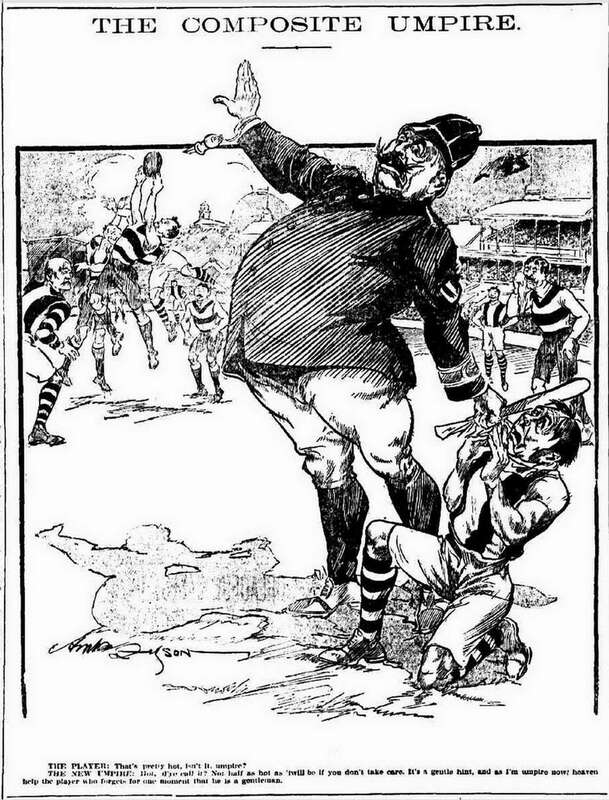 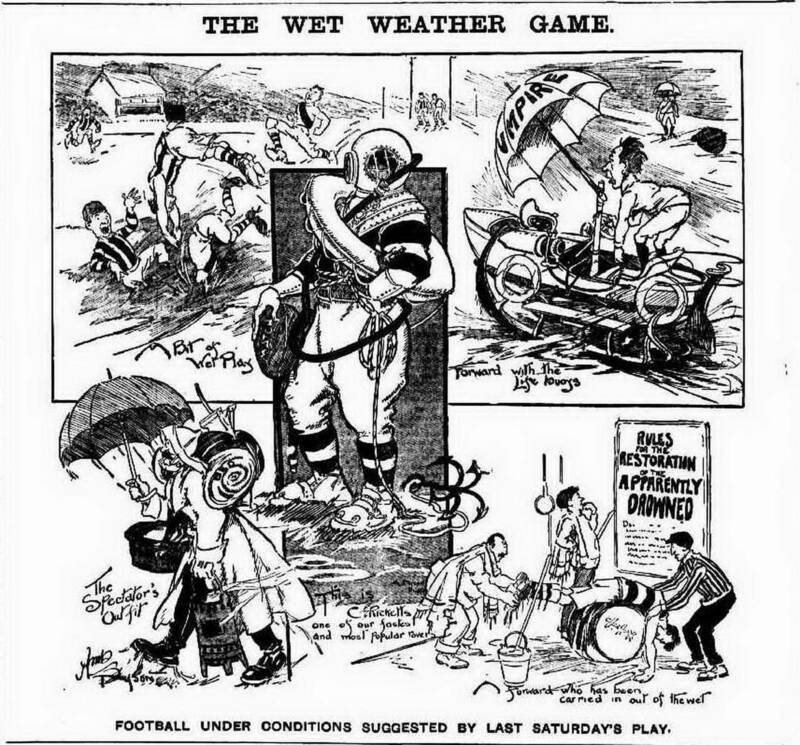 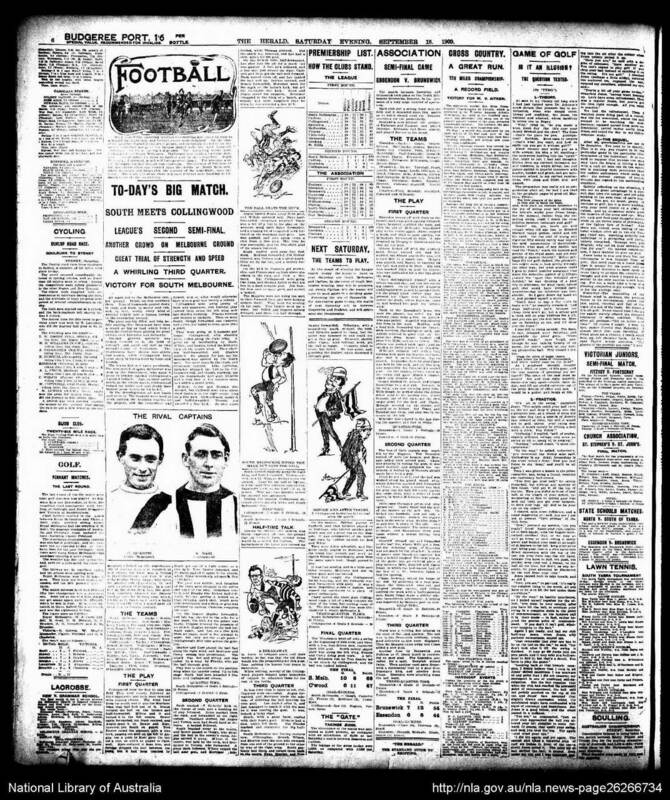 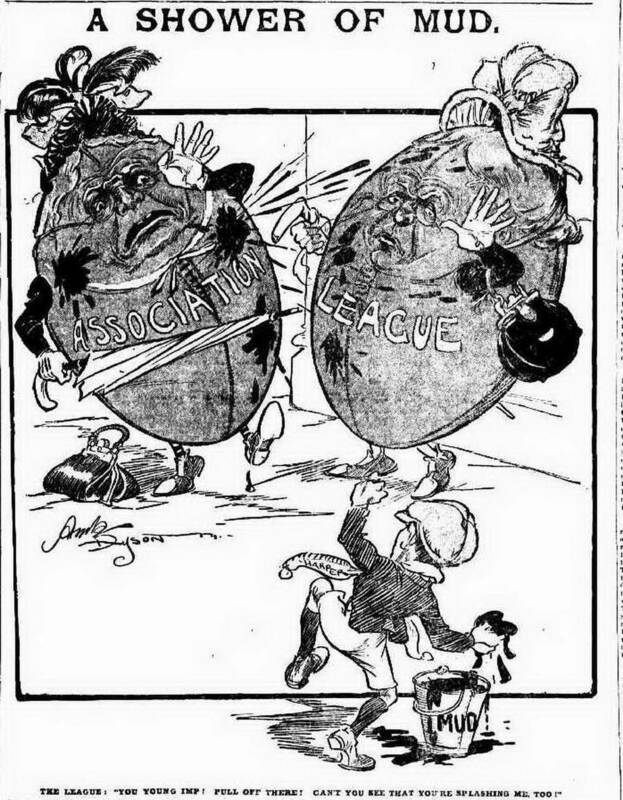 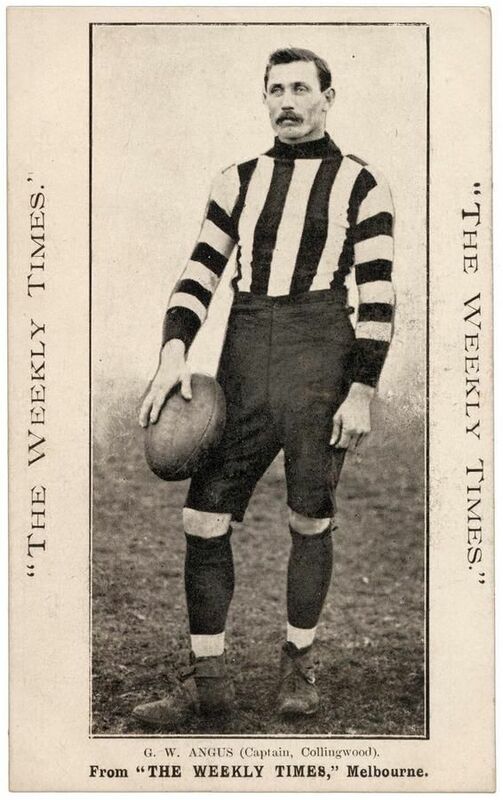 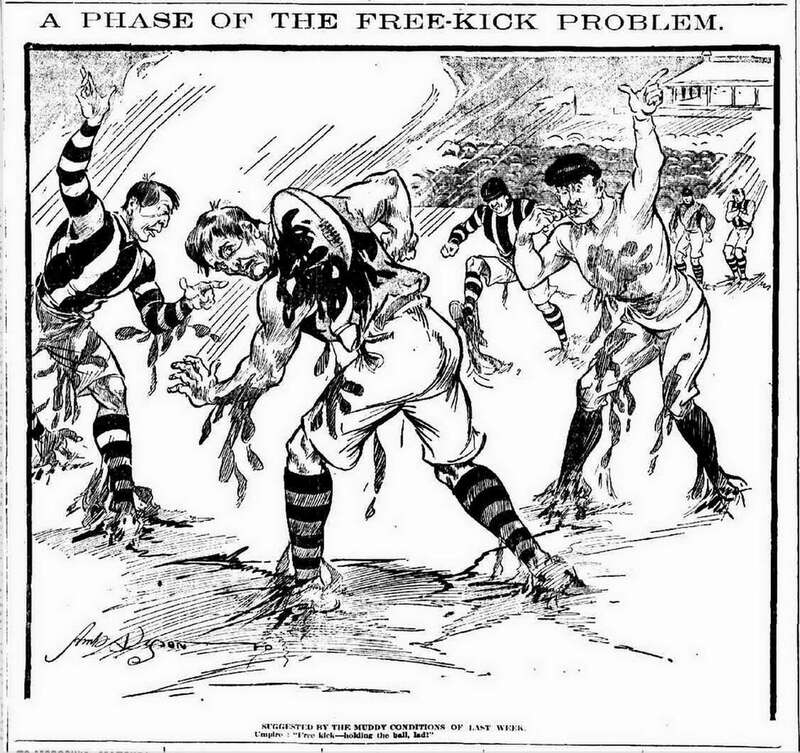 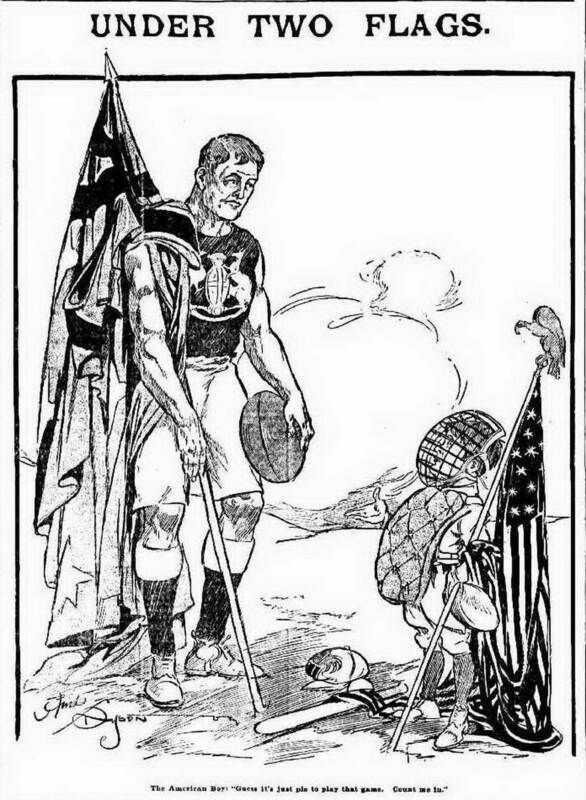 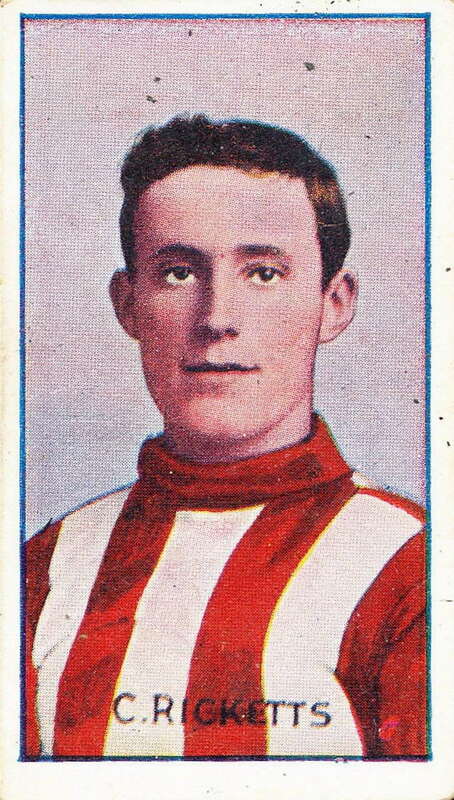 Prior to 1909 there were no regular illustrations or photos in the Herald's football coverage. 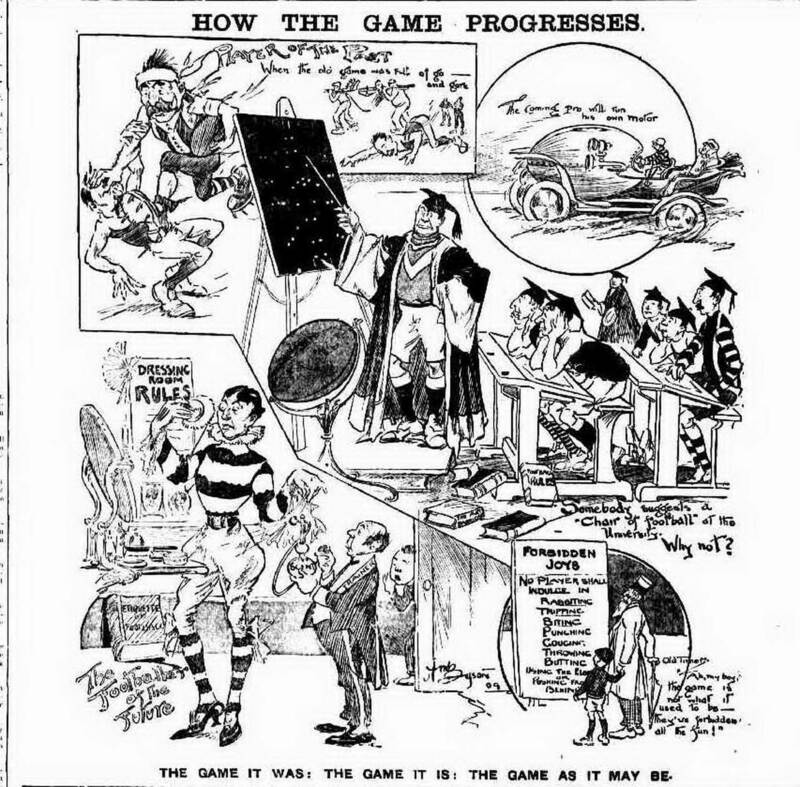 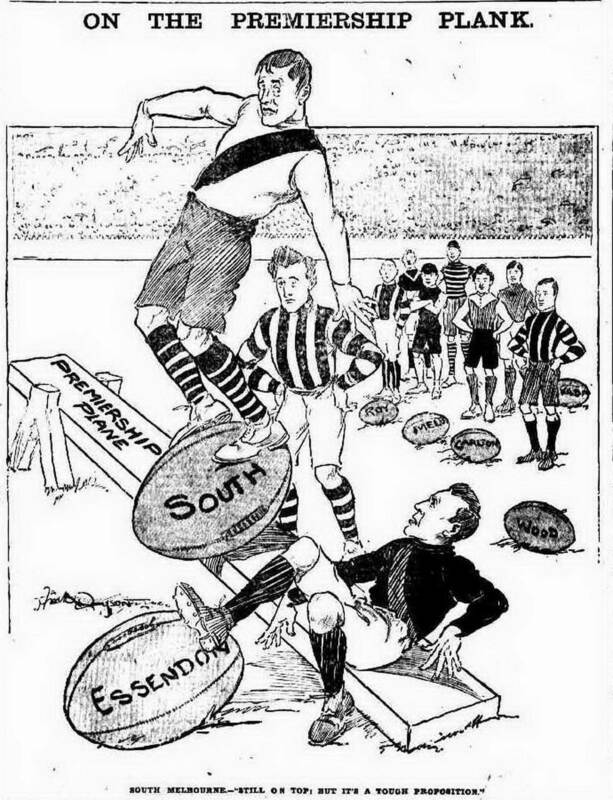 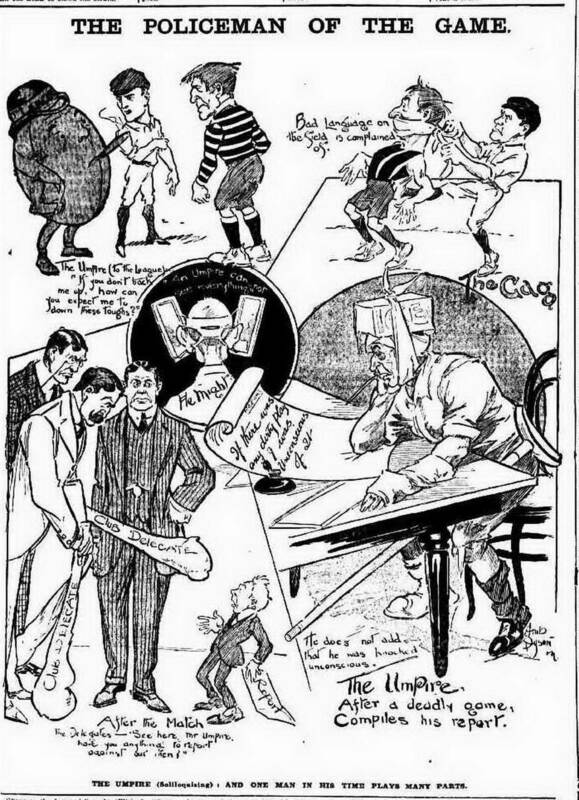 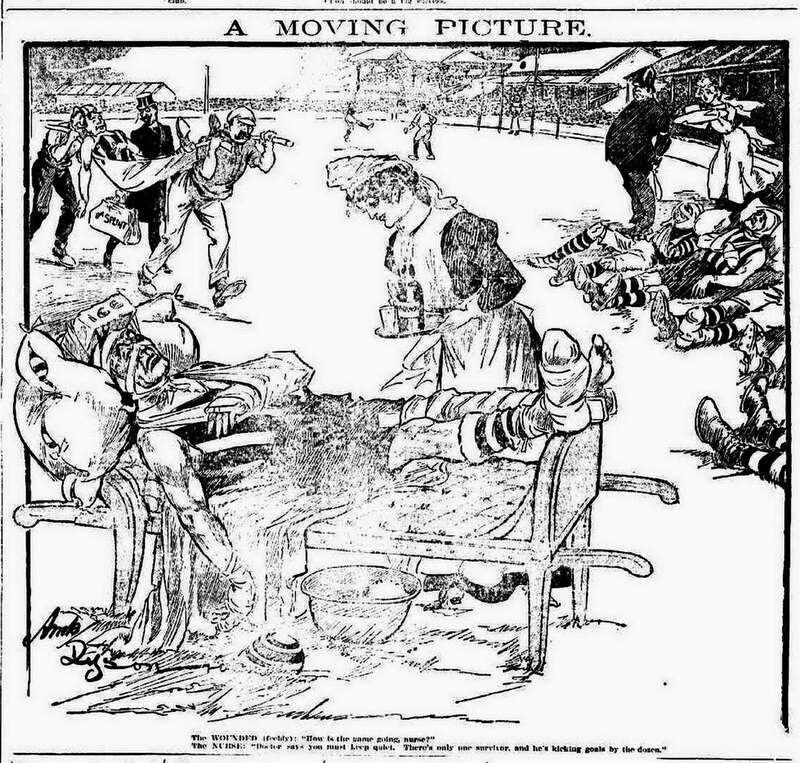 1909 saw a huge change with Dyson supplying the Friday illustration and photos from the Saturday games appearing in the Monday paper. 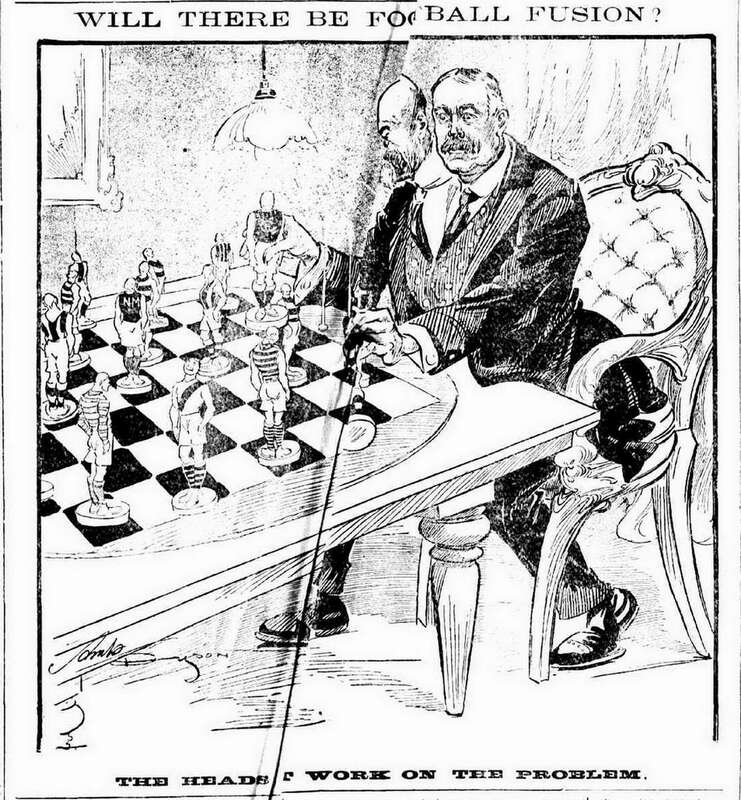 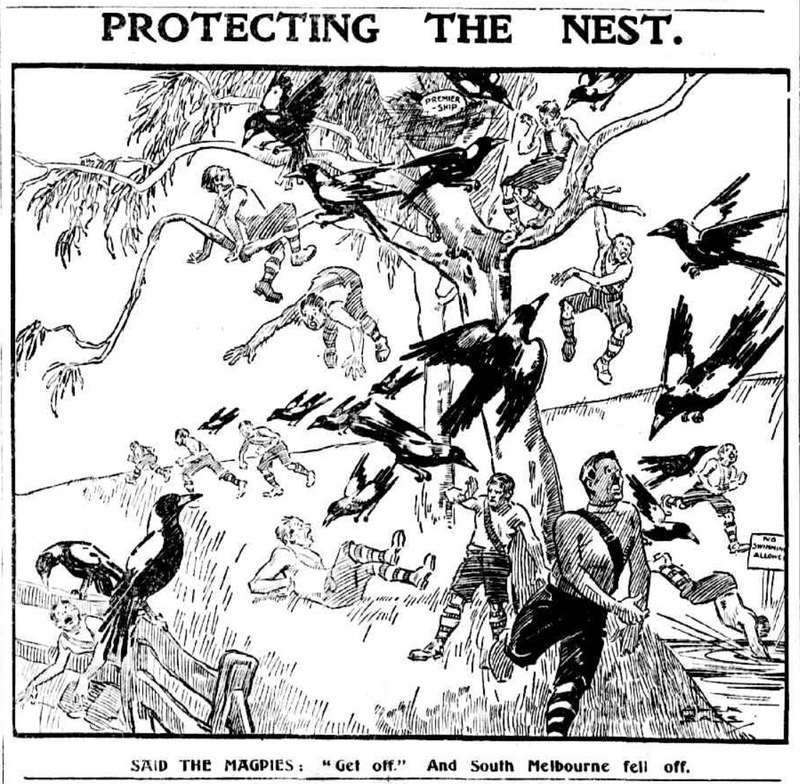 In late 1911 Ambrose Dyson collapsed at work, The Herald reported the news to its readers on the spots page where his illustrations usually appeared on the same day they published his last illustration. 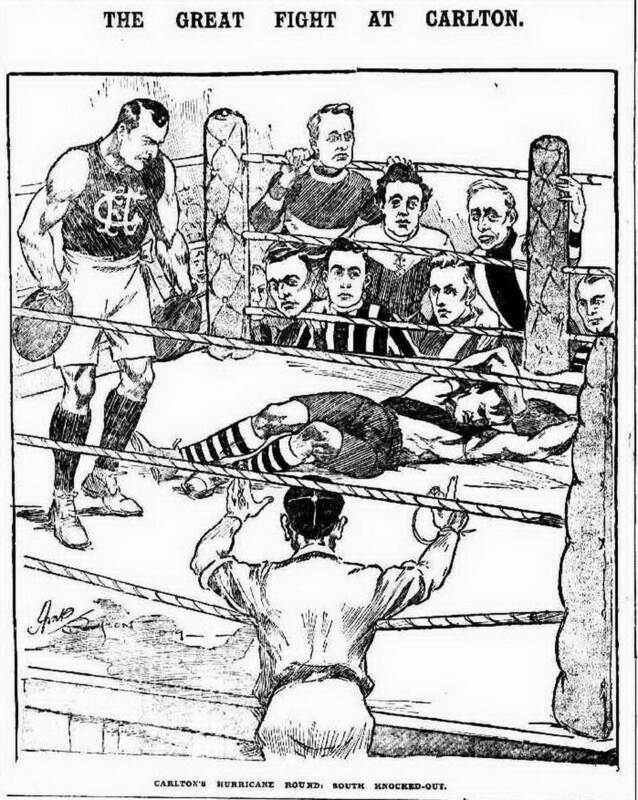 Ambrose did not recover after this event and in 1913 sadly, the Herald reported his death. 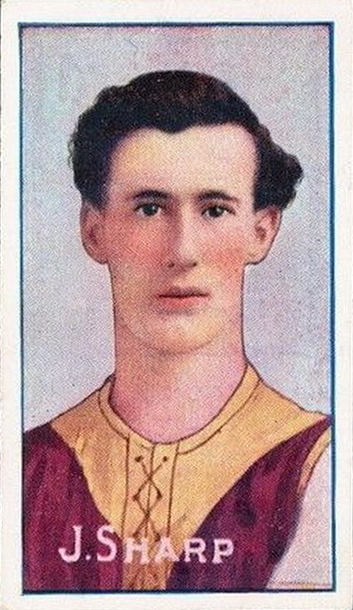 turn, and is now in a low condition. 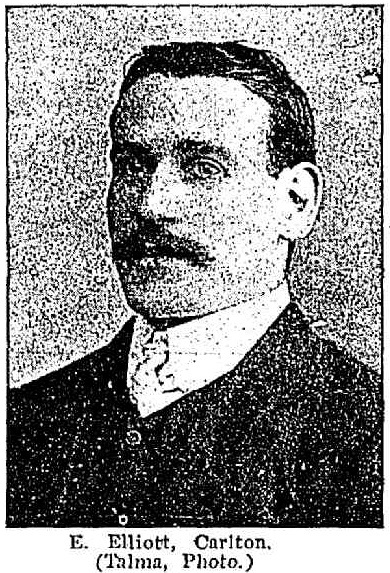 Death of Mr Ambrose Dyson. 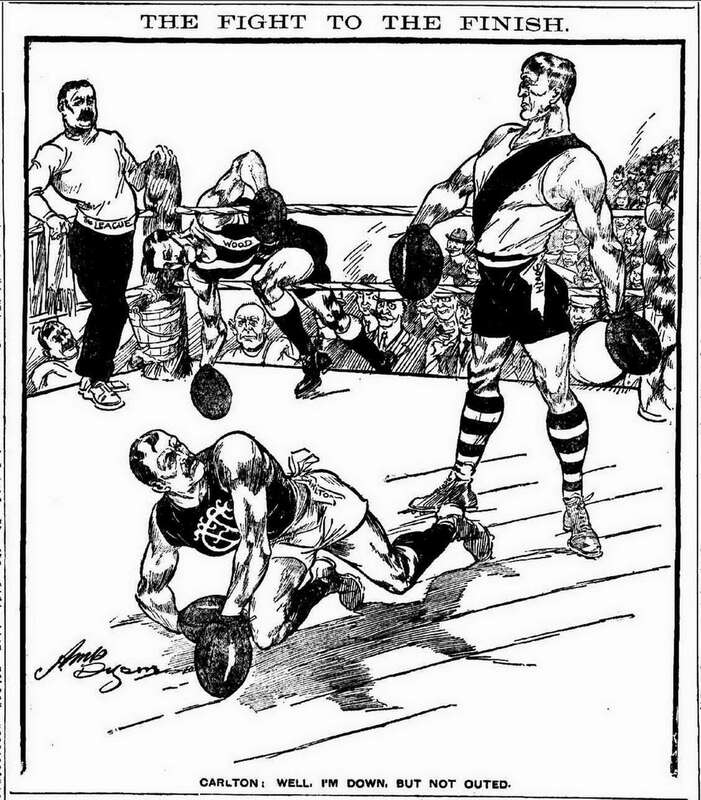 It will be learned with regret that Mr Ambrose Arthur Dyson, the well-known Australian black and white artist, died last evening, at the age of 37 years. 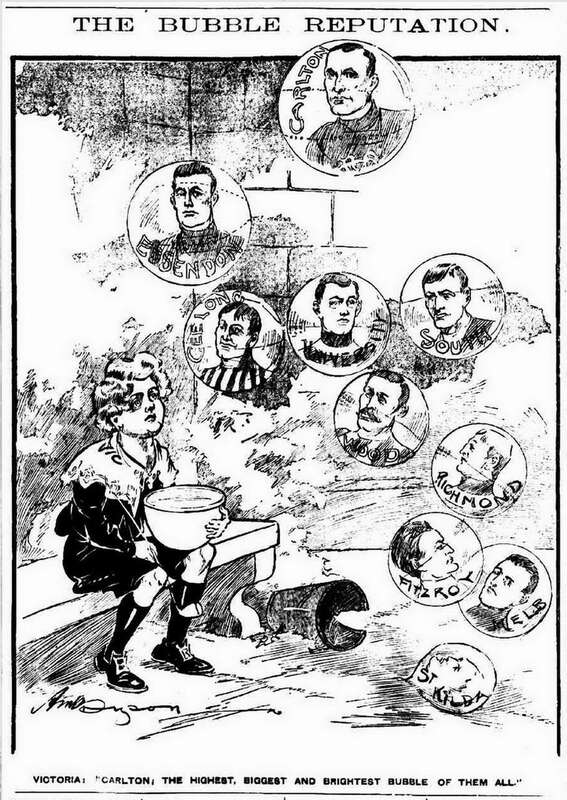 The cause of death was bronchial pneumonia. 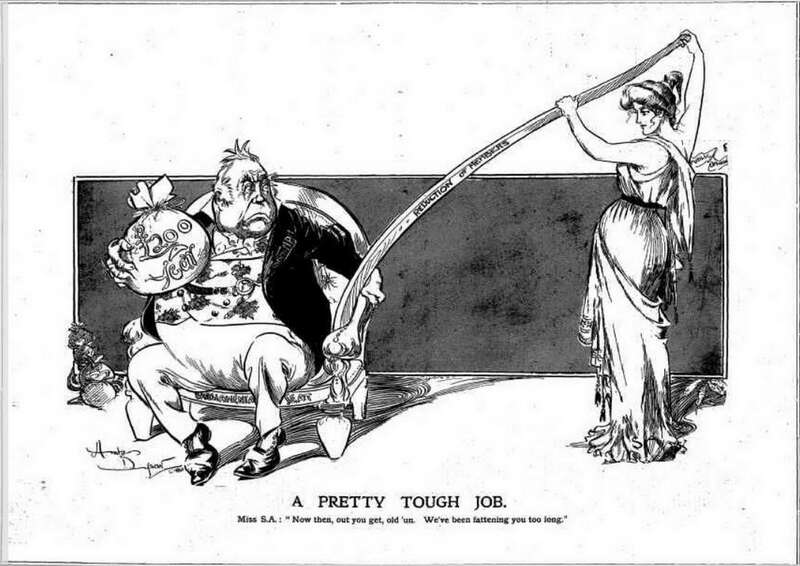 Mr Dyson collapsed some two years ago, while at work, and, although he rallied from time to' time, ho never entirely recovered from the illness. 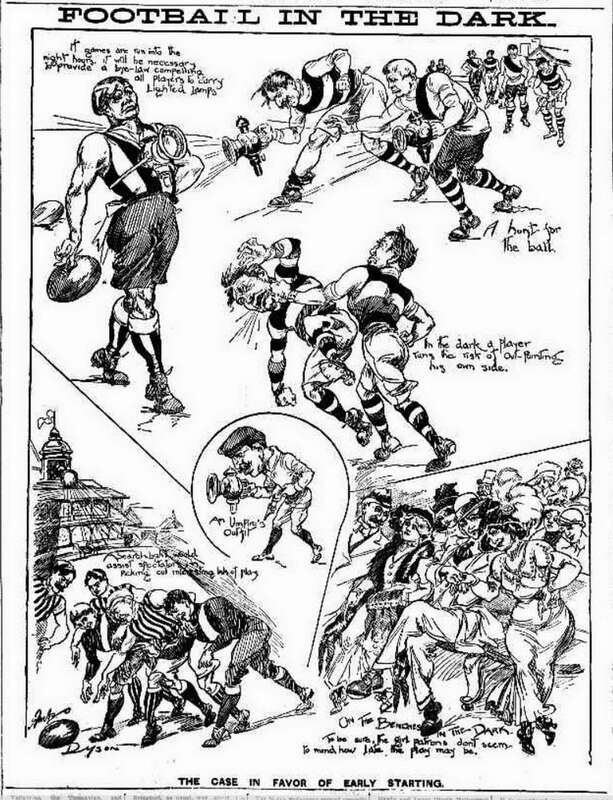 Mr Dyson's work as a black and white artist and illustrator was favourably known throughout Australia, and indeed, in Great Britain. 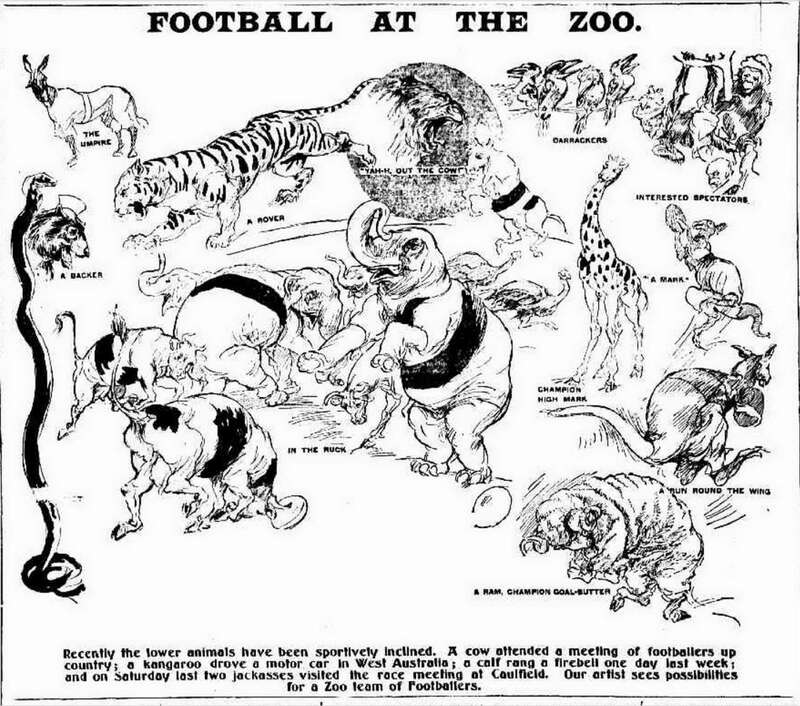 He had a special facility for cartoon work and was the originator of the football cartoons in this paper. 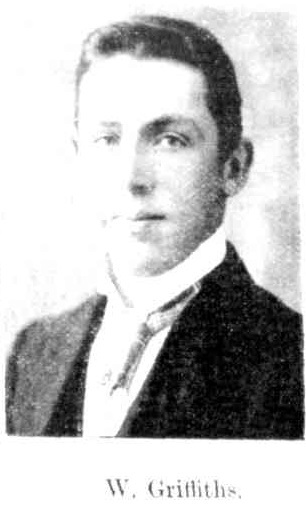 He was the son of Mr George Dyson, retired mining engineer, and Mrs Dyson, of Barkley, street, St. Kilda, and 'a brother of Mr Edward Dyson, one of the lending story writers of the Commonwealth, and of Mr Will Dyson, like himself, a black and white artist. 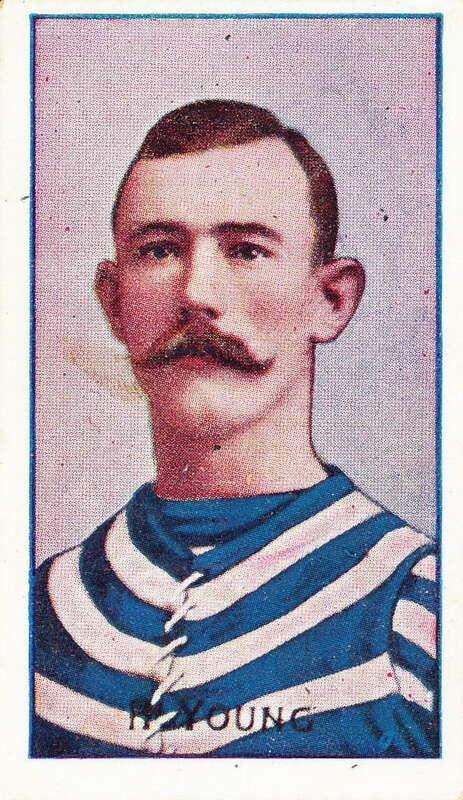 The announcement will come as a surprise to many friends and acquaintances that Mr Dyson was a married man, with one child. 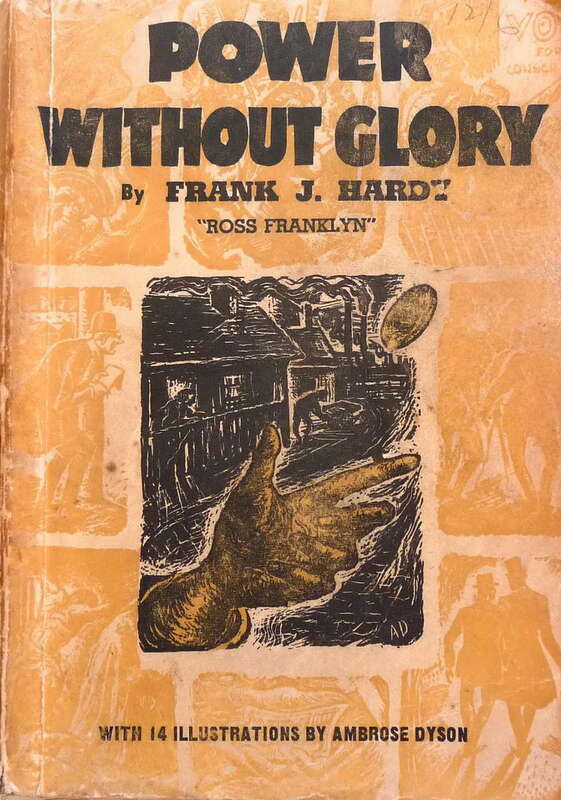 Ambrose Dyson’s son, also called Ambrose, was also an artist, famously contributing the artwork for Frank Hardy’s famous novel about Melbourne crime and politics, ‘Power without Glory’. 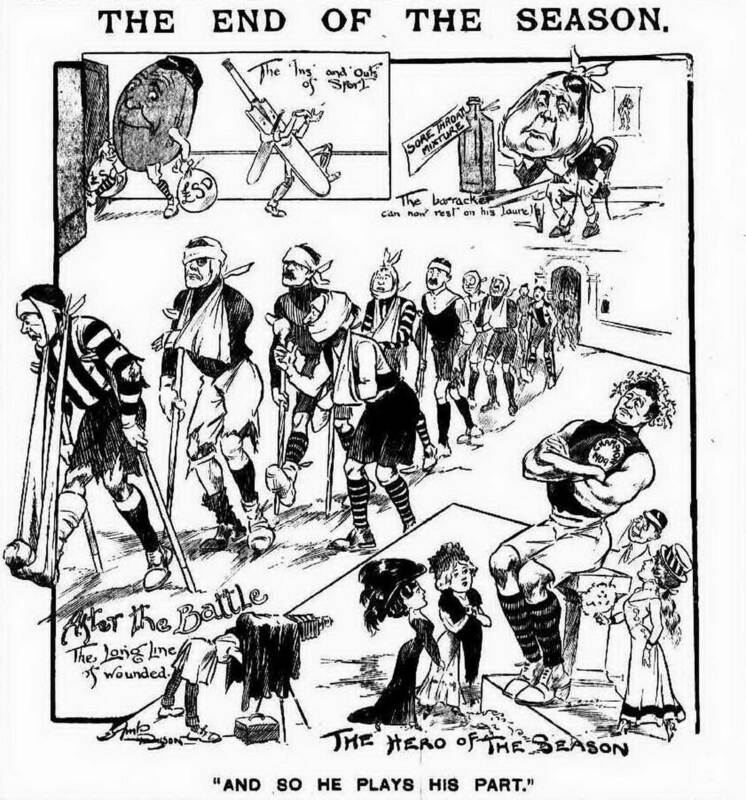 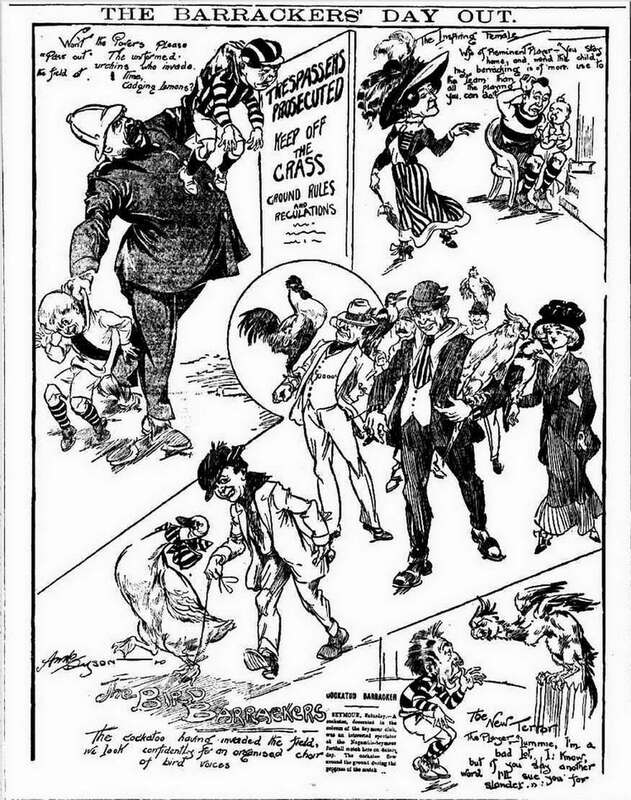 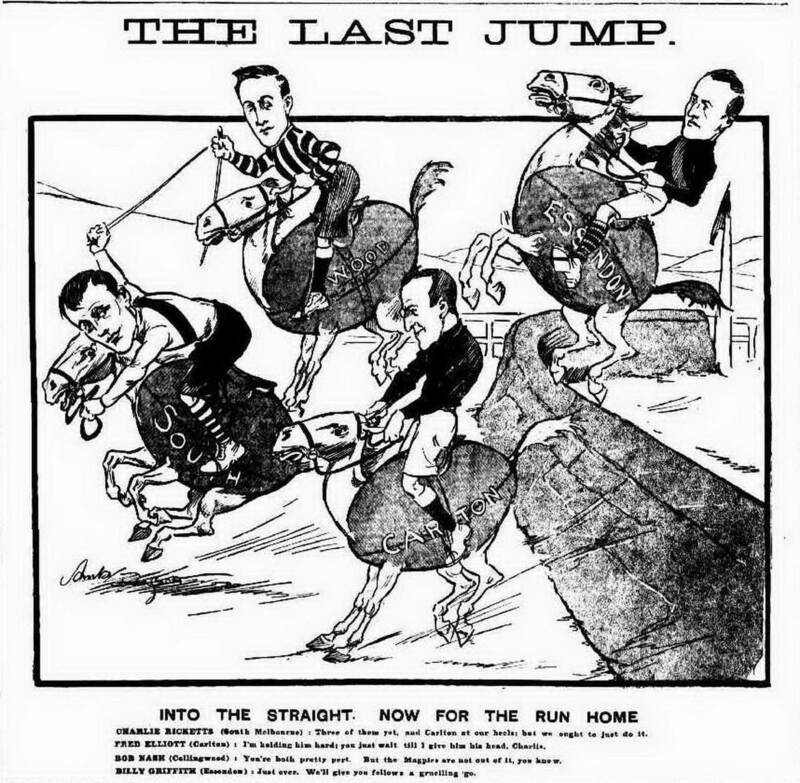 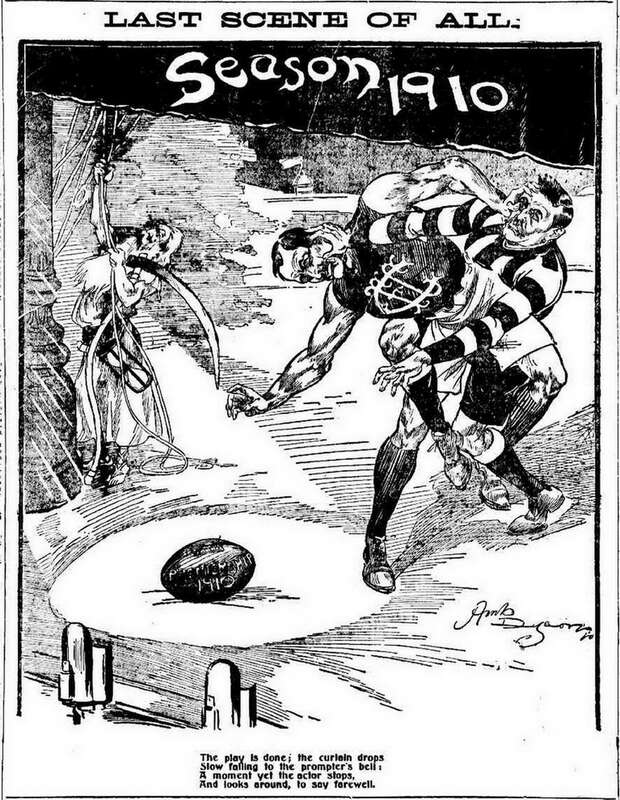 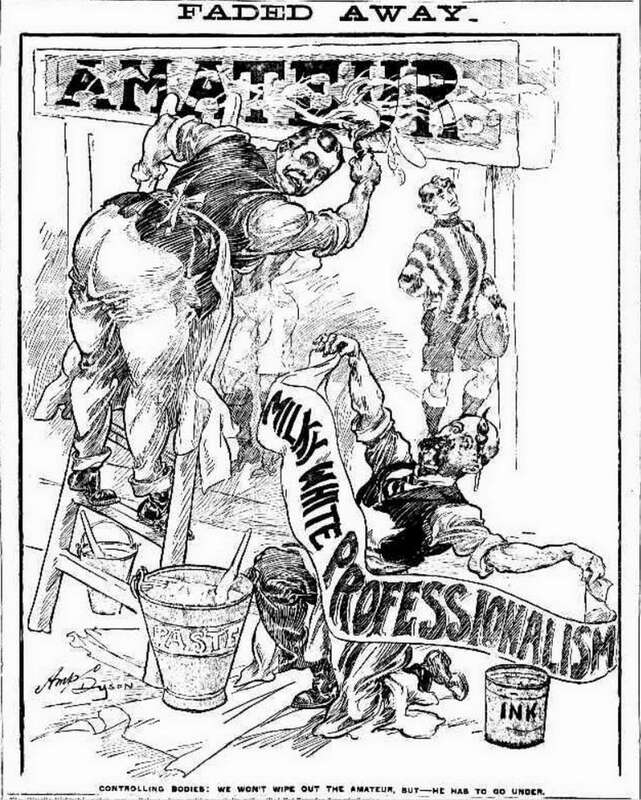 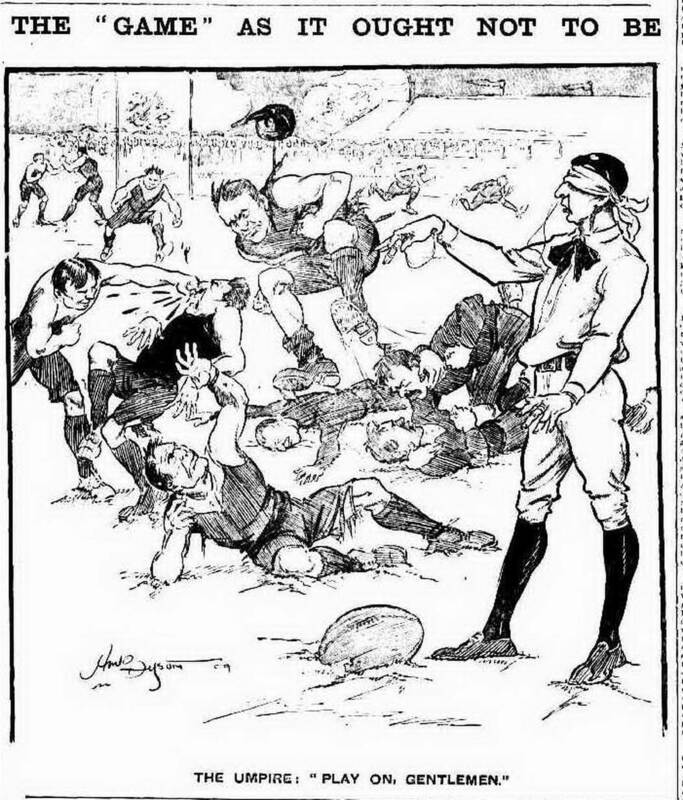 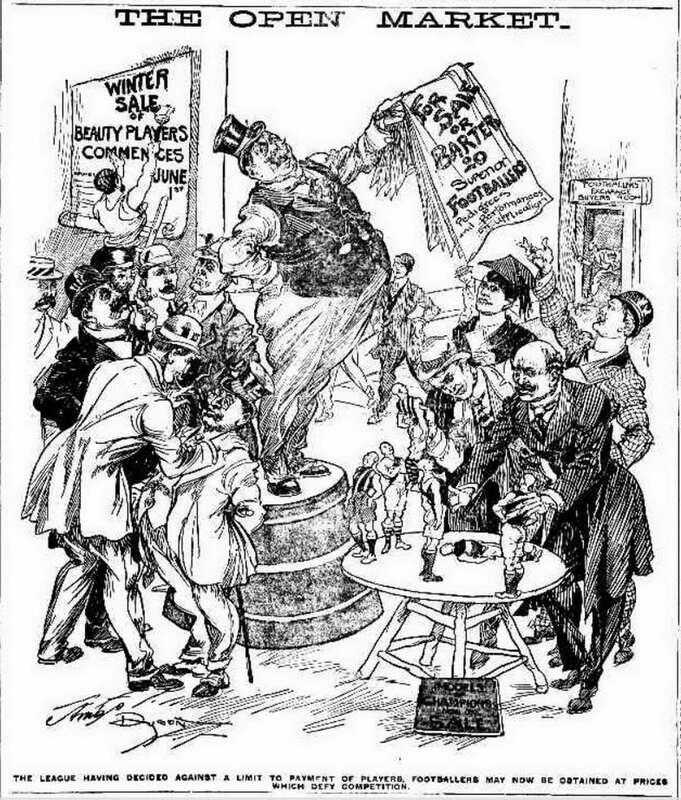 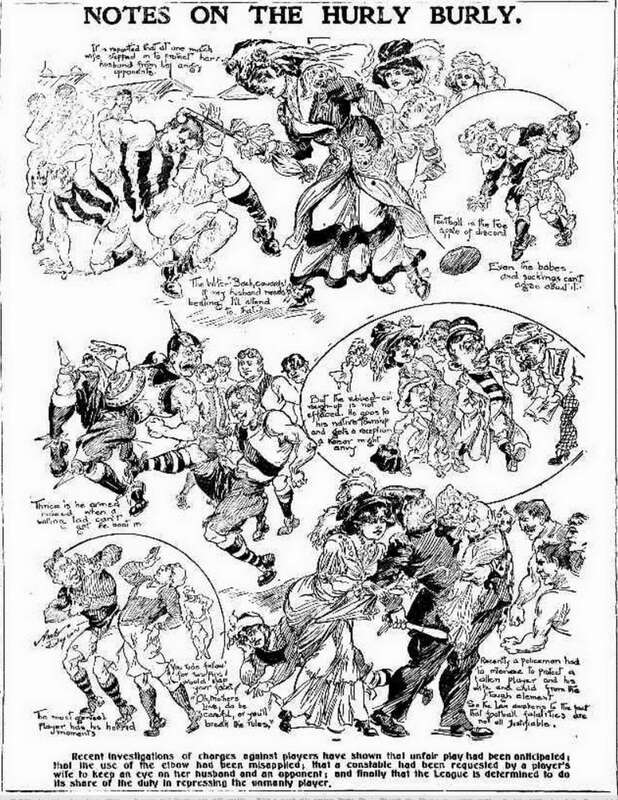 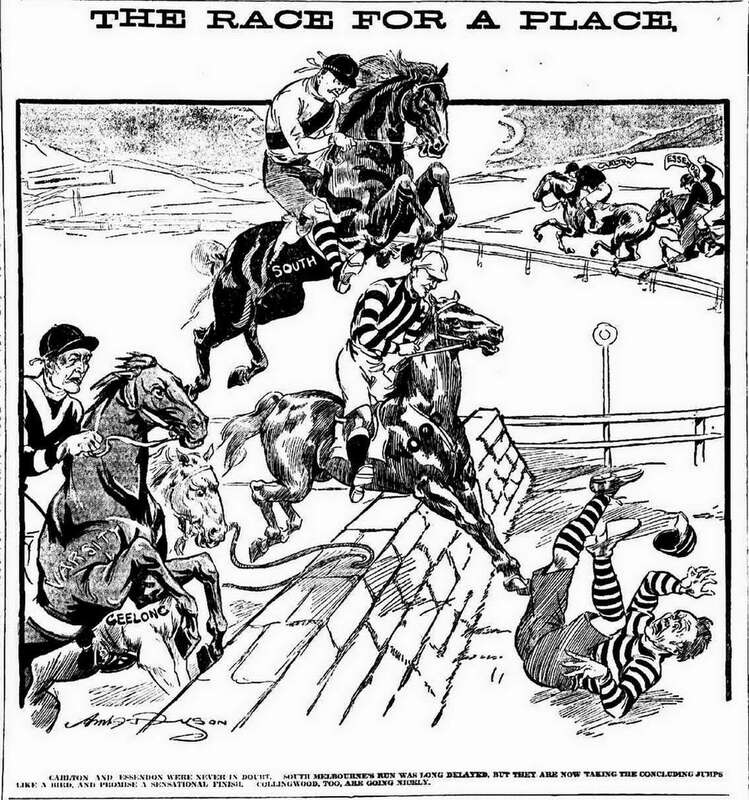 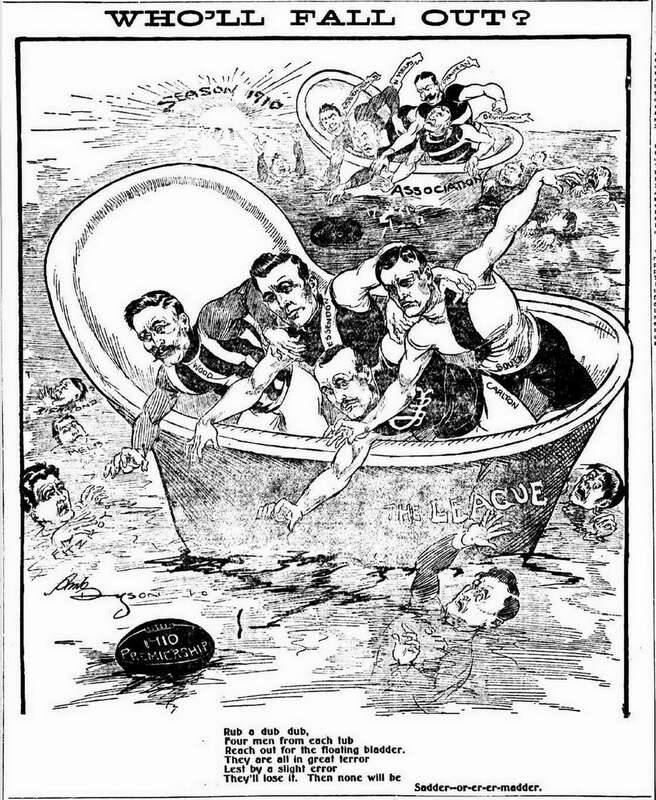 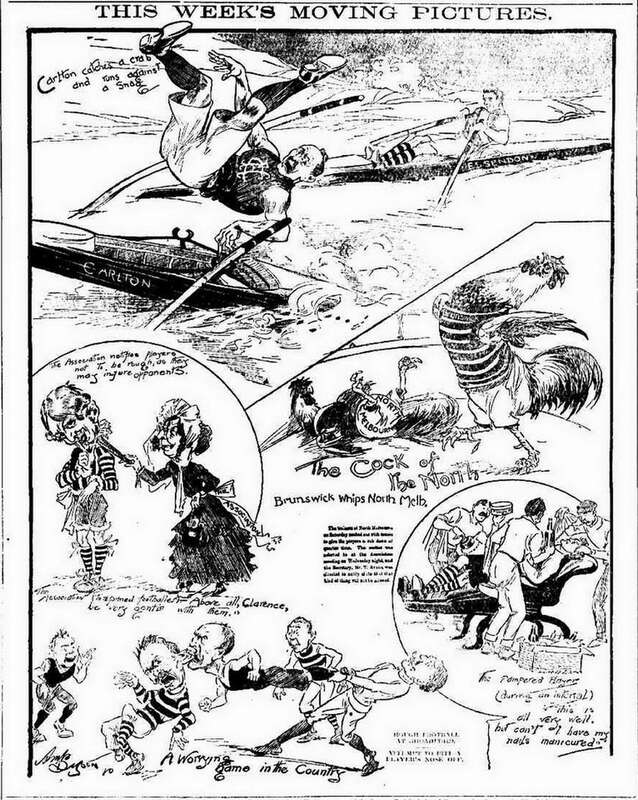 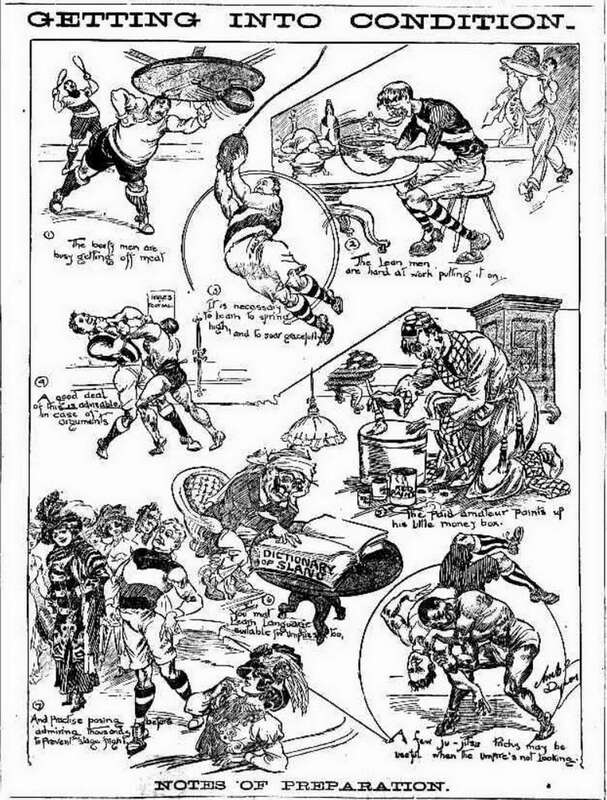 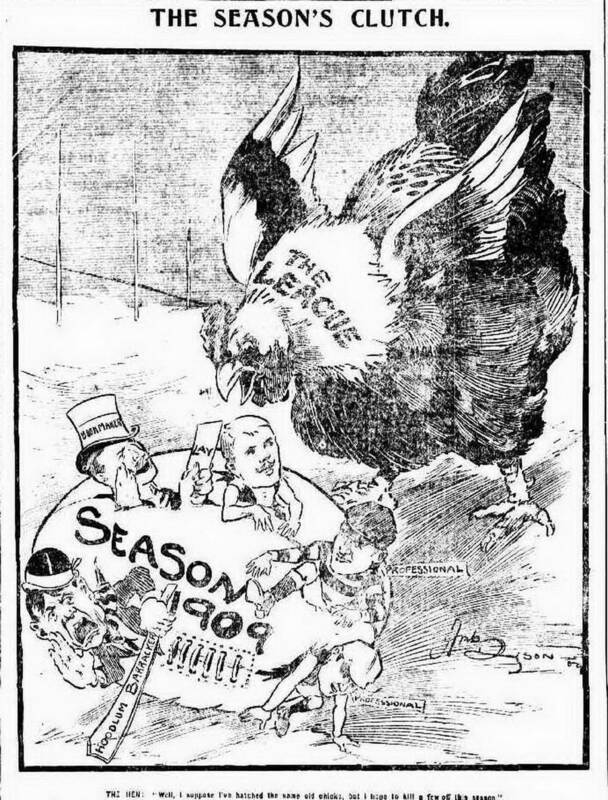 Alek Sass illustrated the remainder of the season and in 1912 took over as sporting illustrator, and in 1913-14, Hal Gye became the Herald cartoonist.